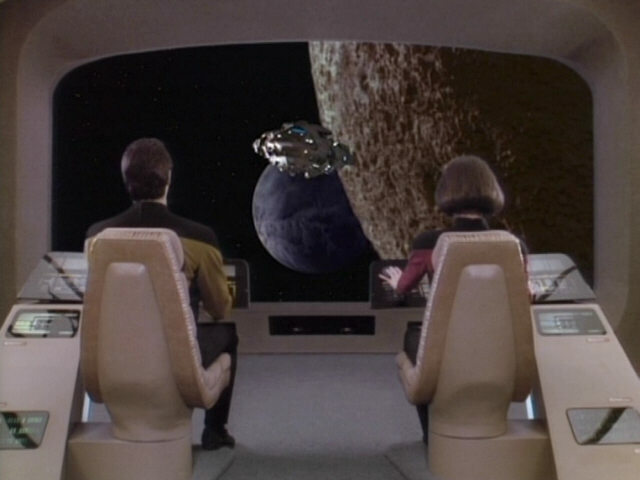 Ex Astris Scientia - Observations in TNG: "Ensign Ro"
Observations in TNG: "Ensign Ro"
Here are some observations about sets, props and visual effects in TNG: "Ensign Ro" without a specific theme, and a comparison of the original TV release (TNG) with the remastered episode (TNG-R). 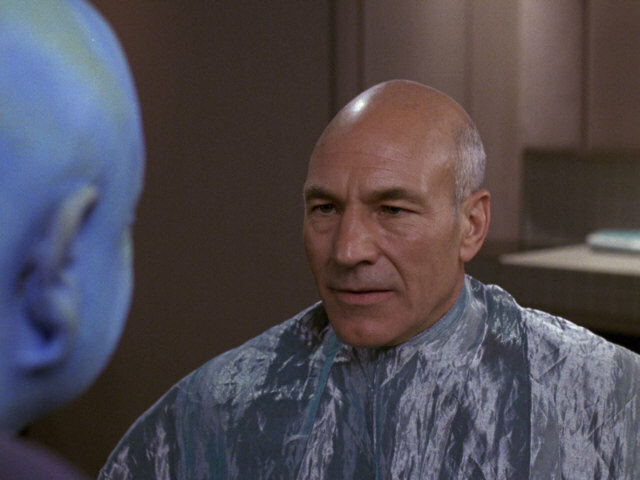 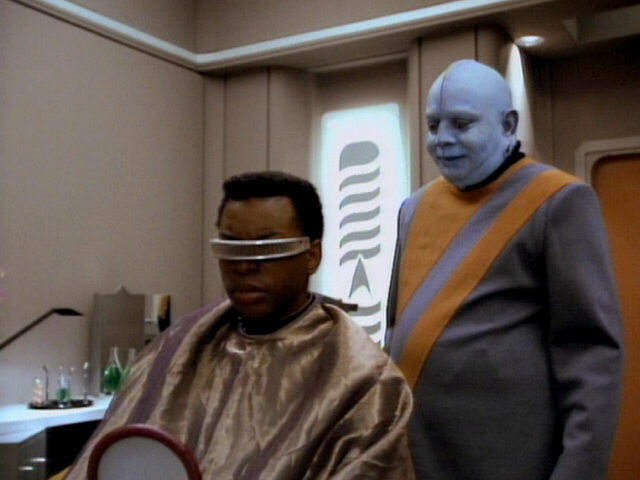 The Enterprise-D's barbershop is seen for the third time in this episode, after appearing in "Data's Day" and "The Host". 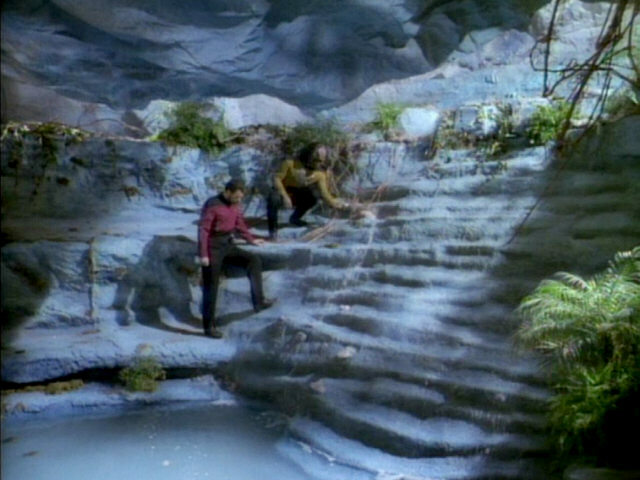 As can be seen when comparing the shots from this episode to those from the two earlier appearances, the set has not changed. 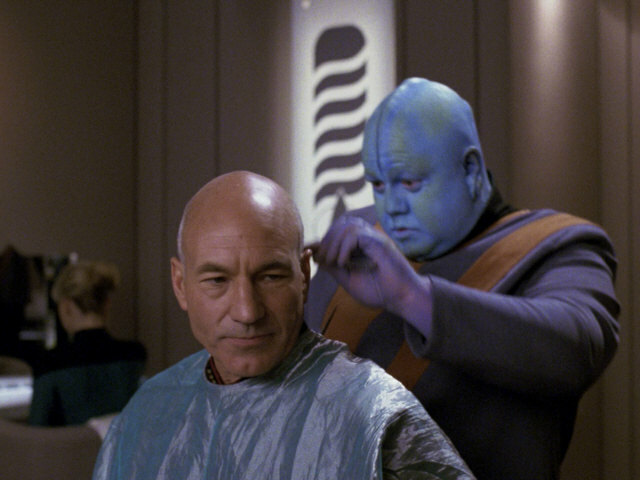 "Data's Day" Mr. Mot's barbershop in HD. 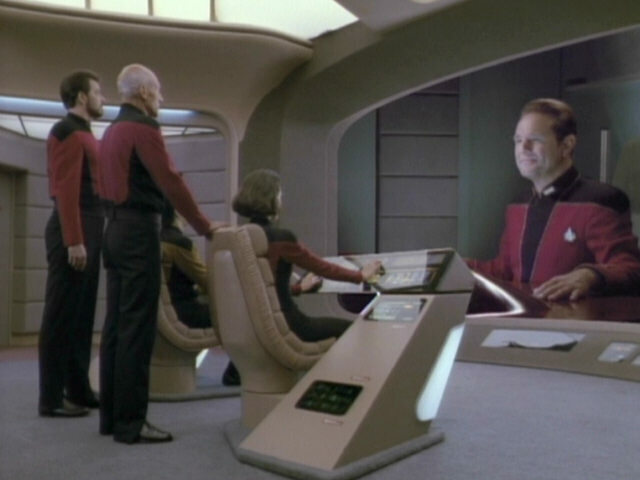 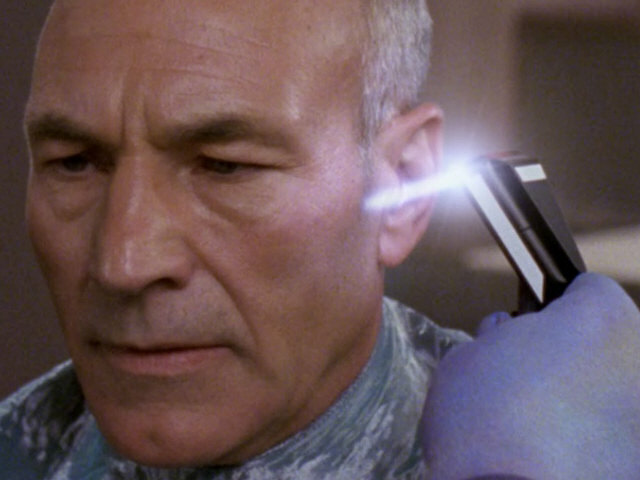 Mot trim's Picard's sideburns with a futuristic gadget. 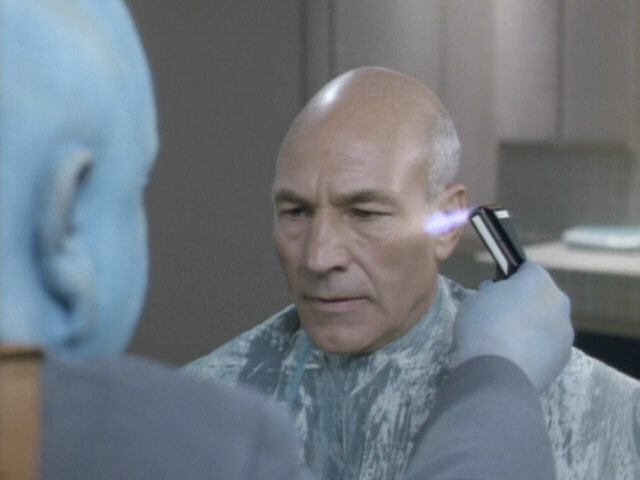 The tool in HD. 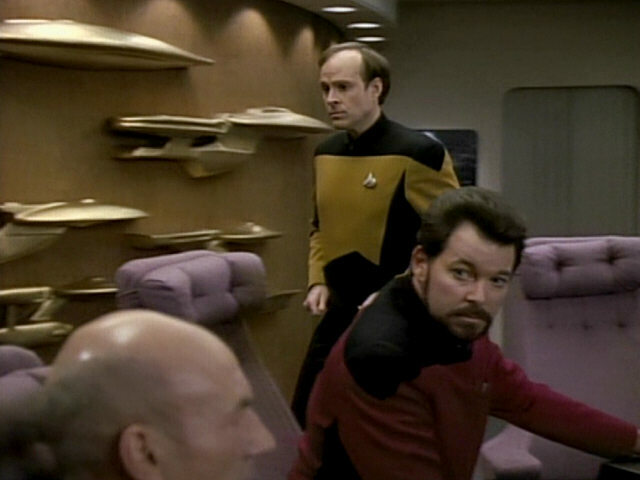 The customer in the background is Vulcan. 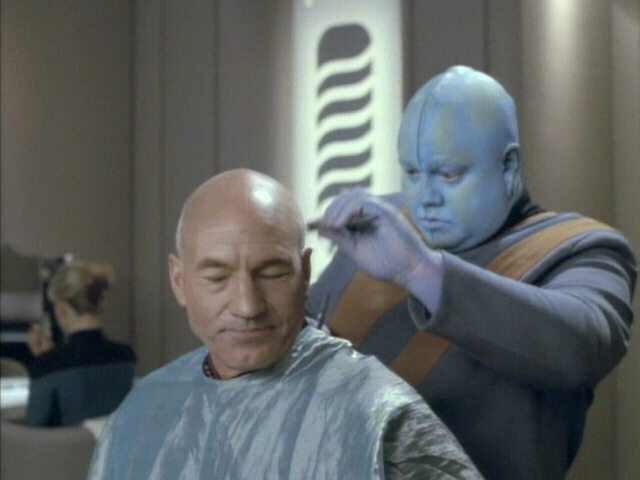 So that is where they get their characteristic bowl haircut from. 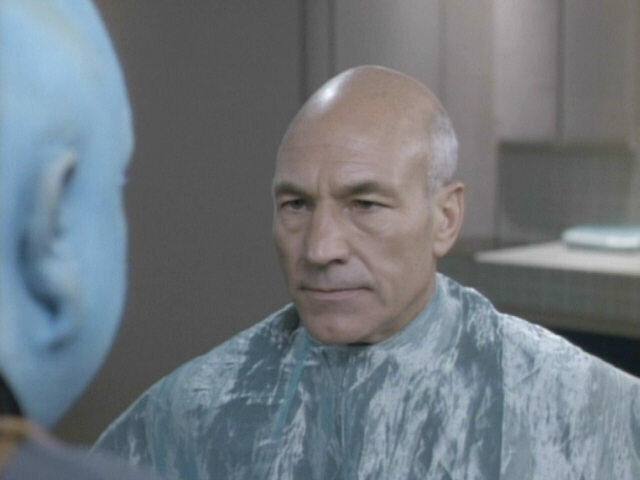 The Bolian barber Mot and the barbershop appear once more in the 6th season episode "Schisms". 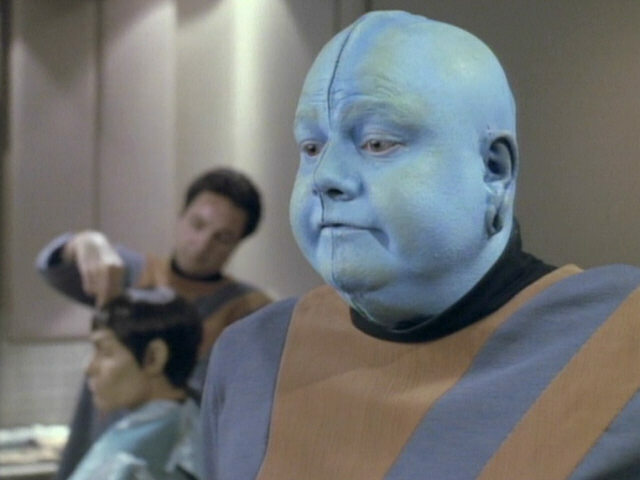 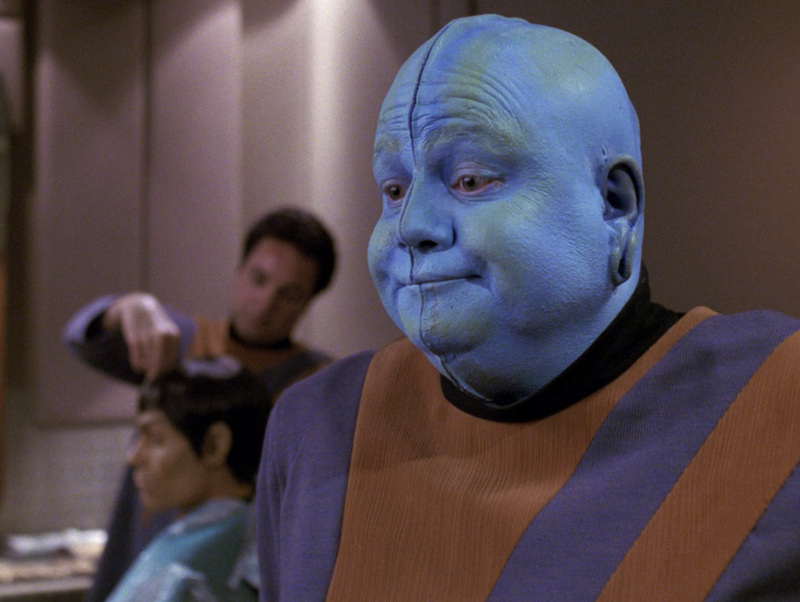 A good look at Mr. Mot's make-up in HD. 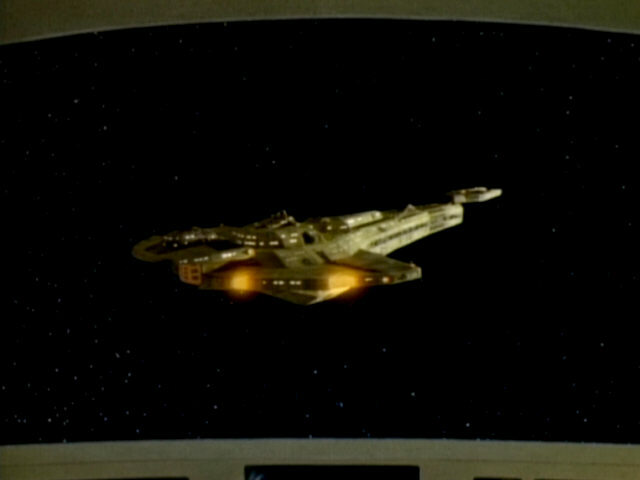 The footage of the USS Enterprise-D approaching Lya Station Alpha is a re-use of footage of the ship approaching Starbase 74, shot for "11001001". 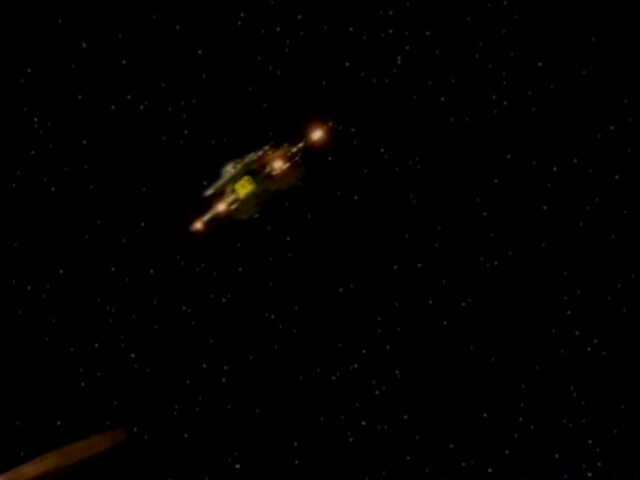 The same footage also appeared in "Remember Me" where the starbase is supposed to be Starbase 133. 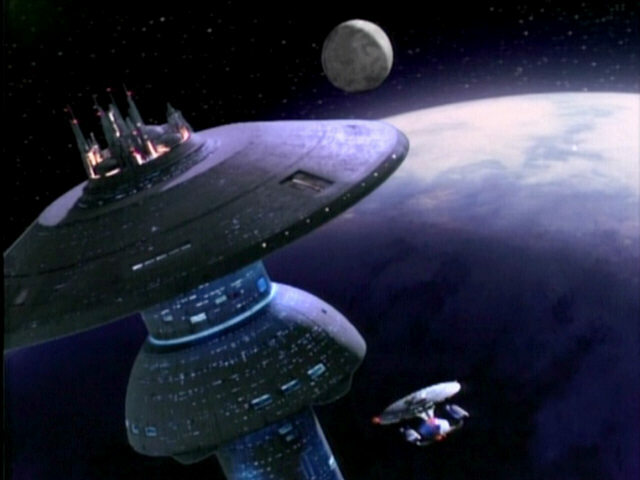 The starbase and planet footage was originally created for "Star Trek III: The Search for Spock", however. 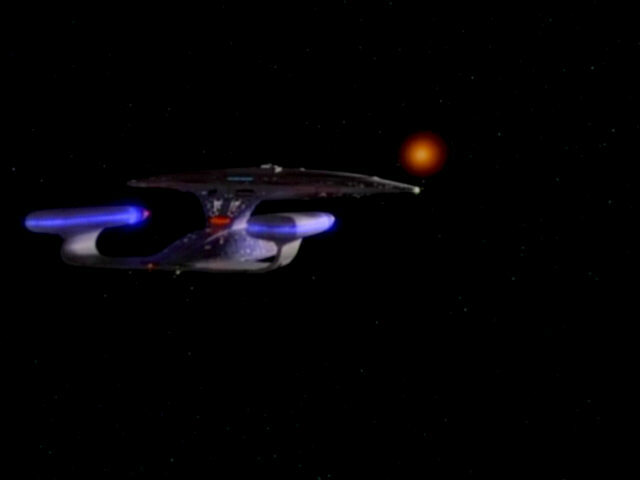 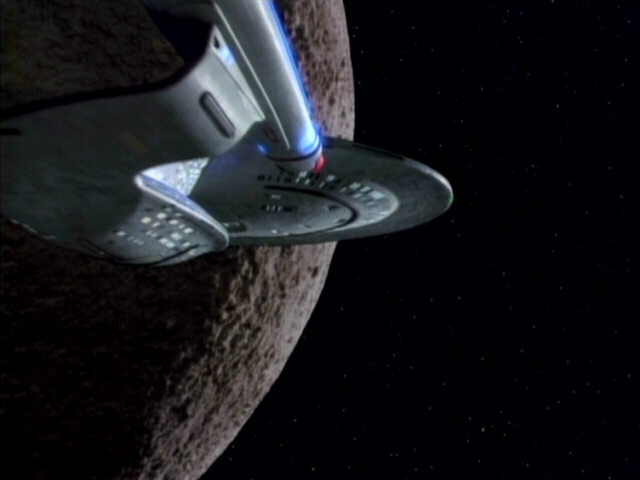 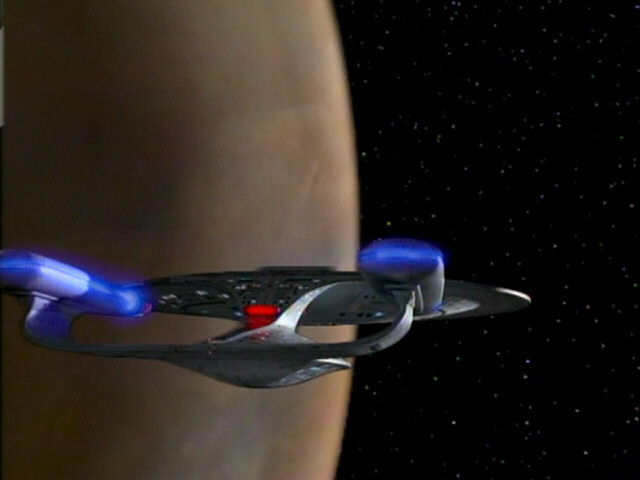 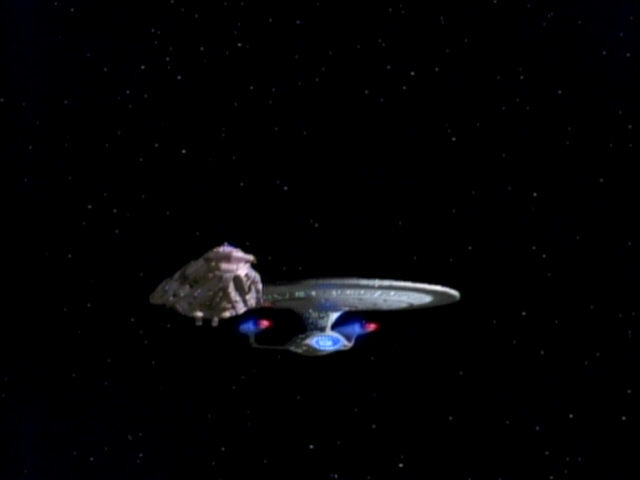 "Star Trek III" In the remastered version of this episode, the color of the planet was changed from blue to turquoise. 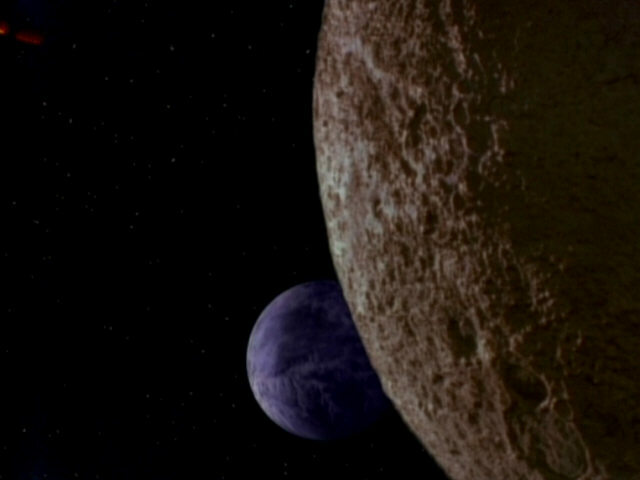 In the remastered version of "Remember Me", the planet was likewise changed from blue to green. 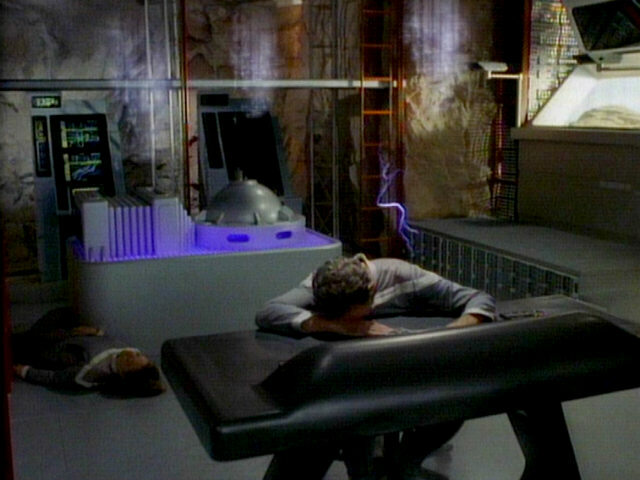 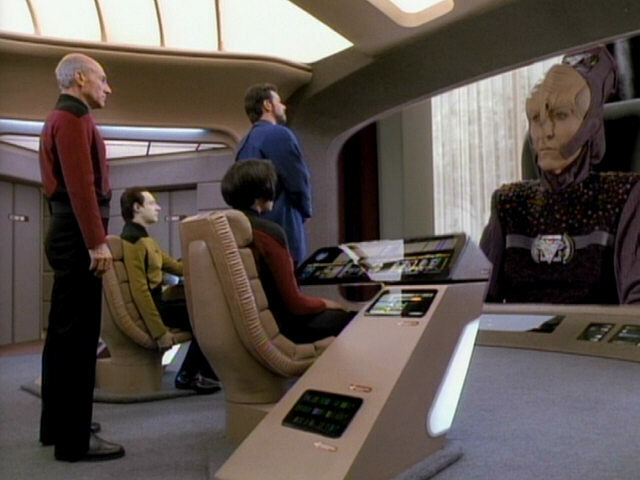 The observation lounge replicator was especially incorporated into the set for this episode. 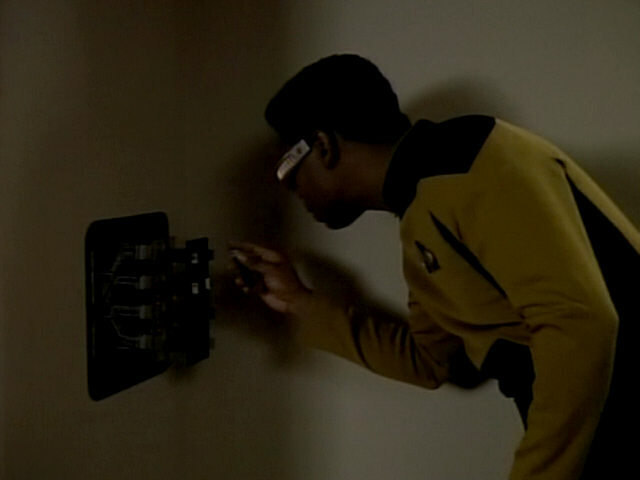 Originally, this side wall featured no console or interface at all. 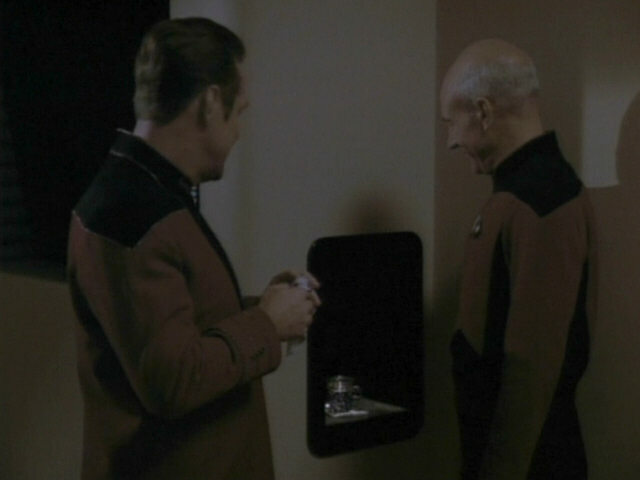 For "The Nth Degree", a hole was cut into the wall and an isolinear chip access terminal was created. 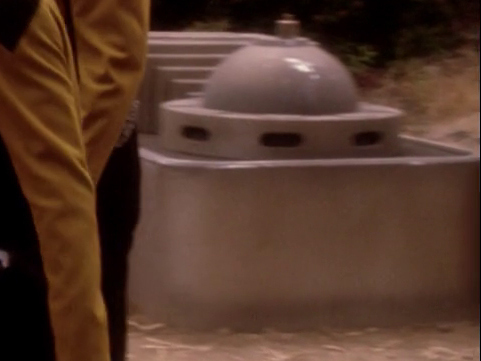 This hole was covered with a removable cover in later season 4 episodes. 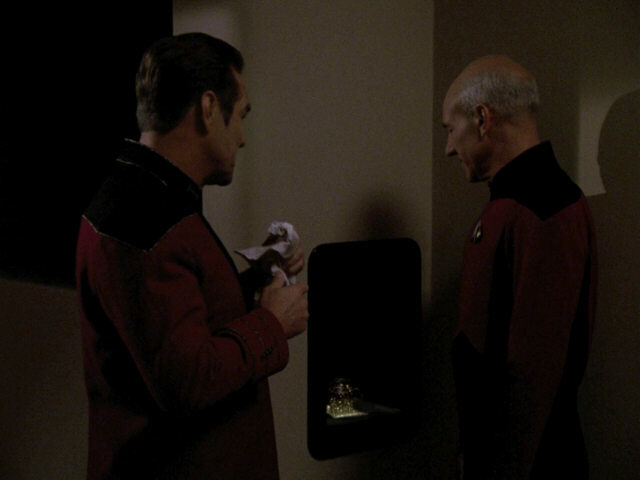 The replicator remained in place until the end of the series. 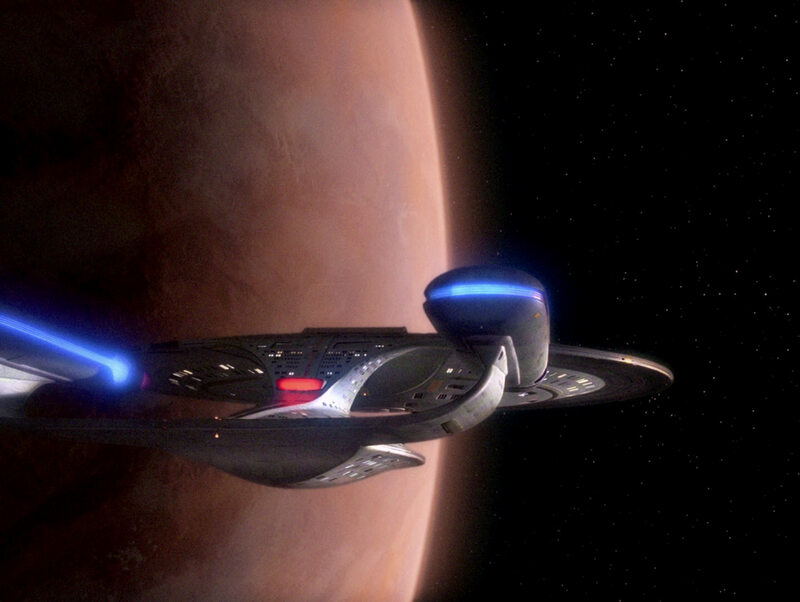 "In Theory" The replicator in HD. 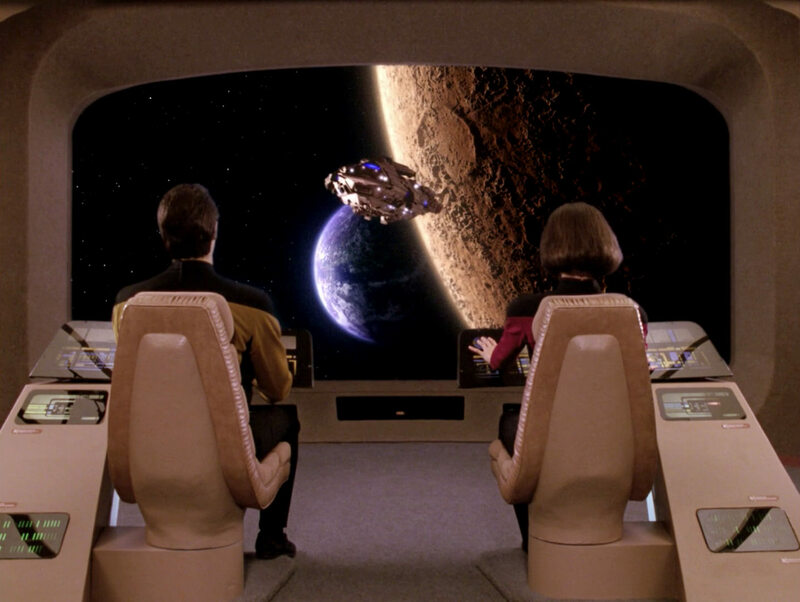 The changed made to the back wall of the observation lounge betweens season 4 and 5 are highlighted in these two screenshots. 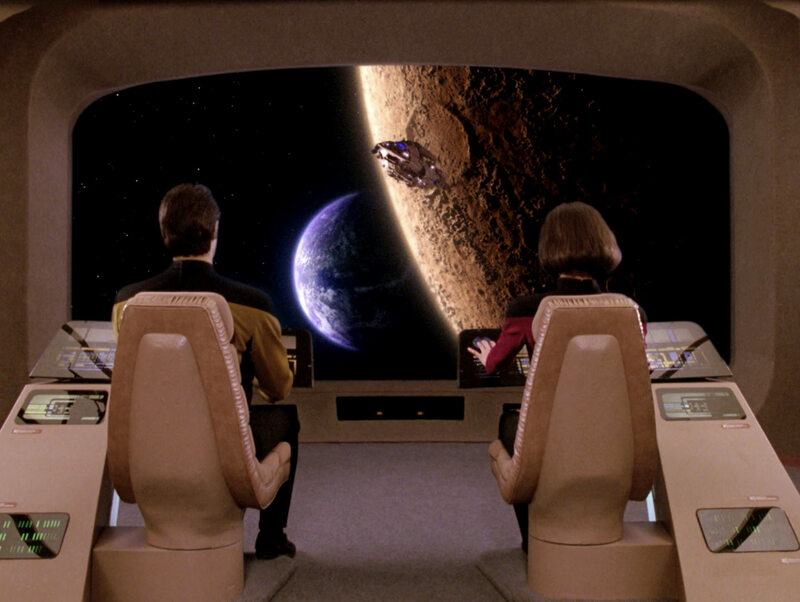 "The Nth Degree" A good look at the new wall in HD. 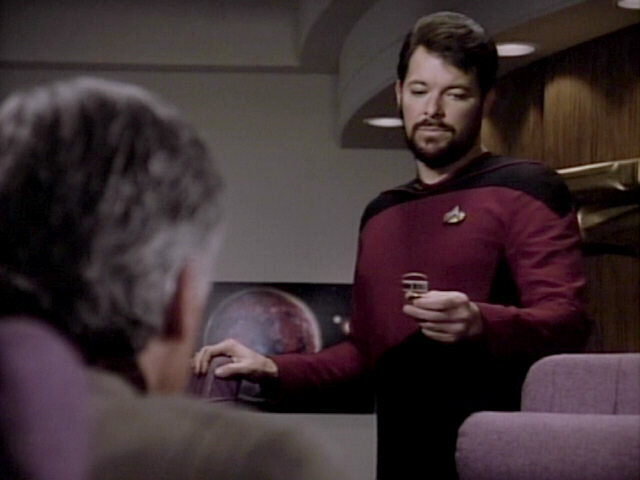 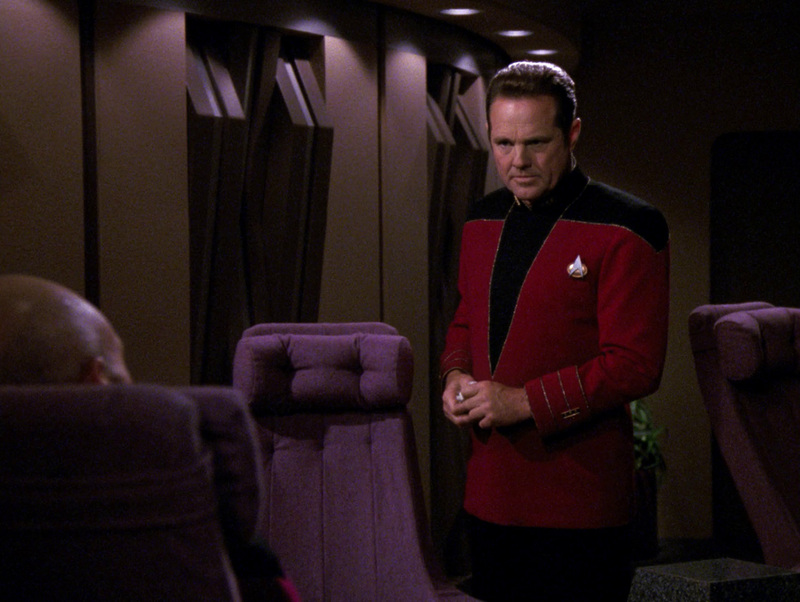 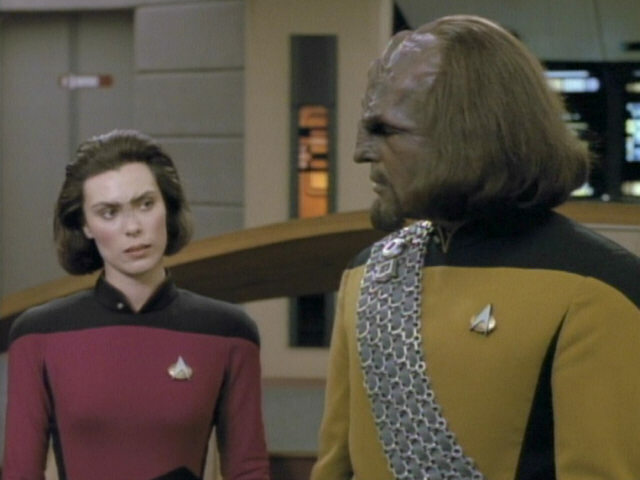 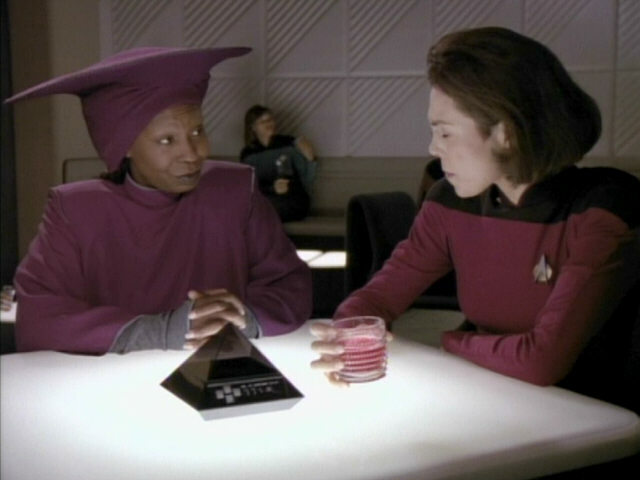 According to the script of the episode, Ro hands Riker a "disc with her orders". 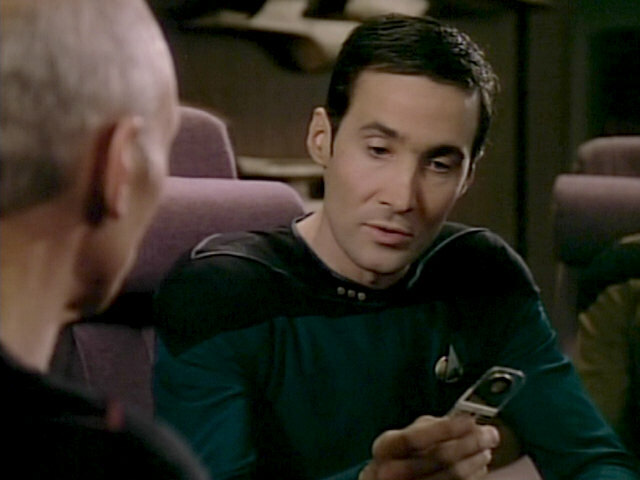 The same data chip was seen in "Lonely Among Us", "The Measure of a Man" and "The Icarus Factor". 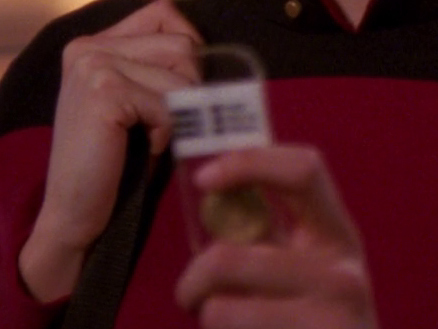 Chips like these usually held important documents, like transfer orders. 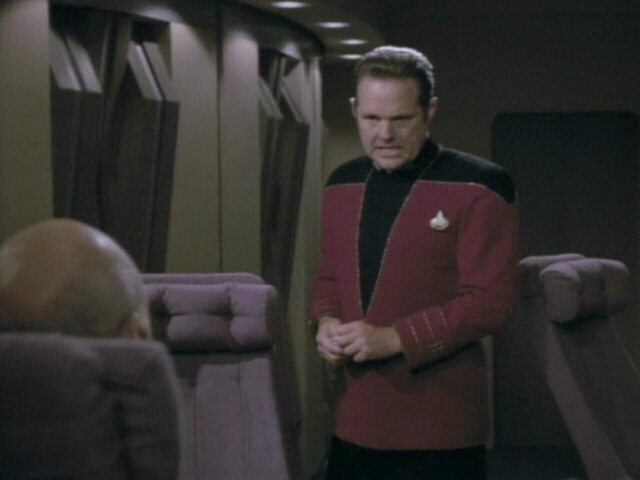 Rick Sternbach: "This was just a different type of non-volatile storage medium than a regular isolinear chip. 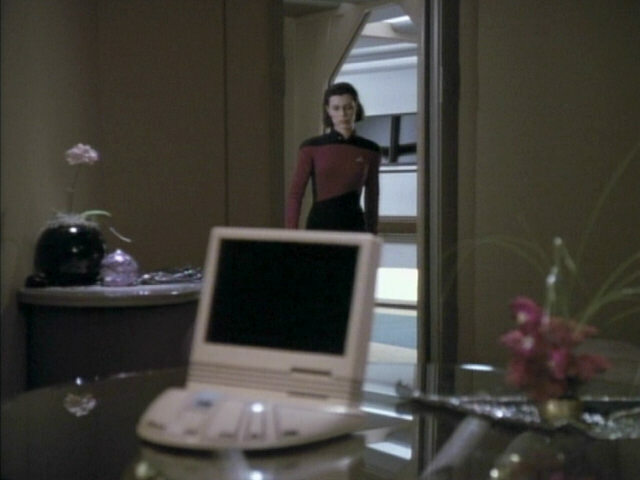 I suspect it has a built-in Bluetooth sort of component to send data to a PADD or tricorder or desktop monitor. 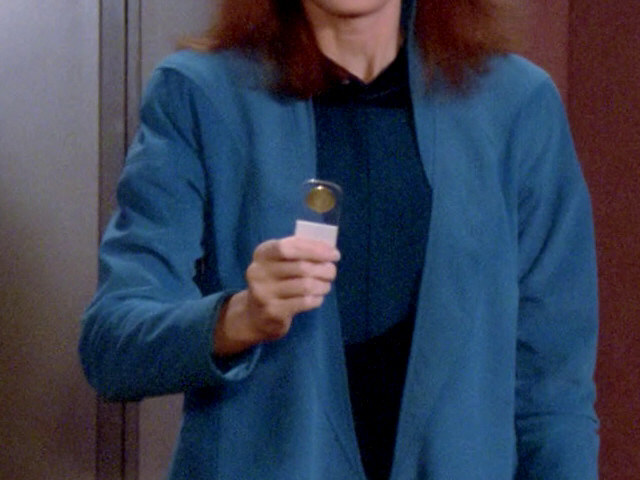 The round brass disk is the actual storage medium. 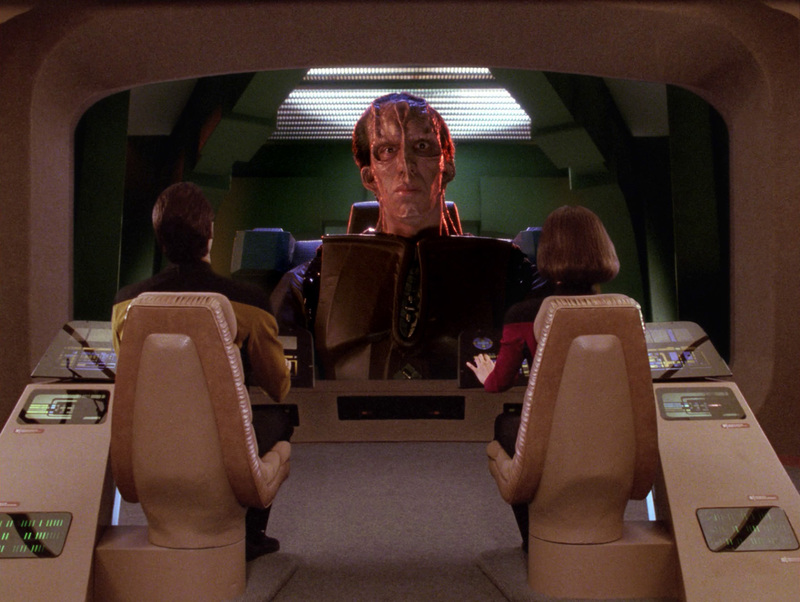 I designed this one, as well as yet another 'non-standard' chip, the recording of Wesley's dad. 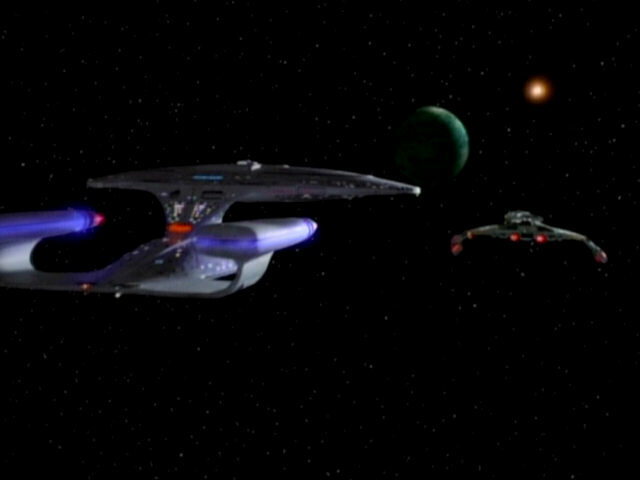 I guess there's lots of different formats in Starfleet. 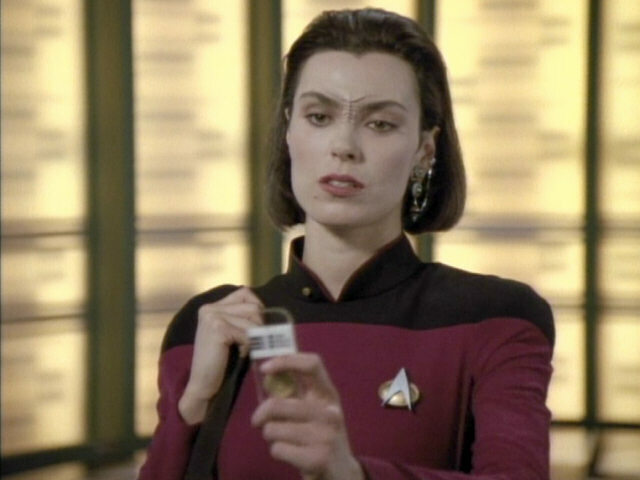 :)"
of a Man" The data chip in HD. 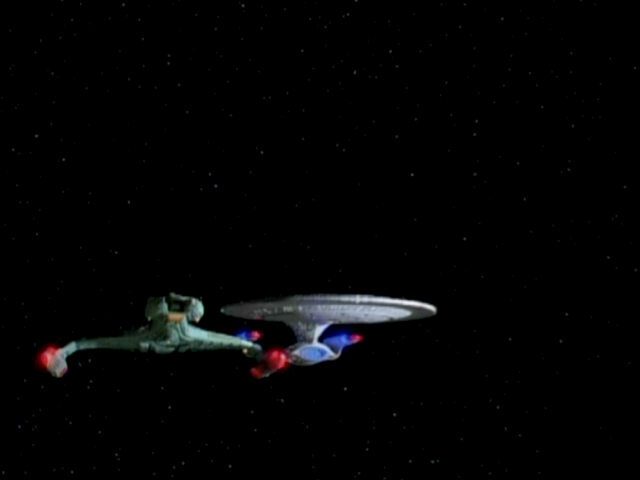 The USS Enterprise-D slowly flies towards the camera and comes to a halt. Enterprise Flybys in TNG and TNG-R As the original footage of this shot could not be located on film, it had to be recreated using CGI. 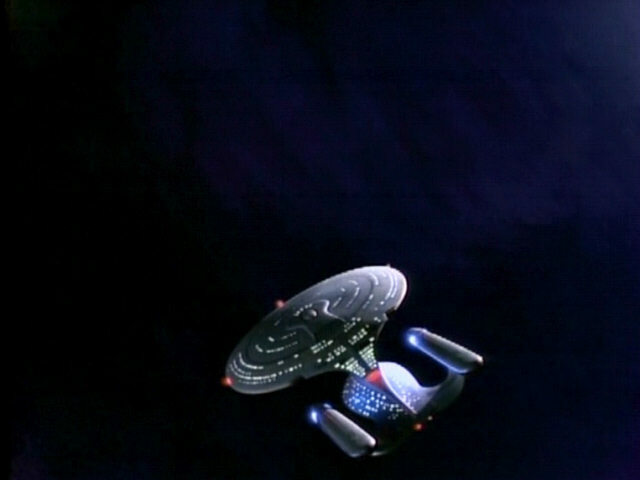 In this episode, the new, much improved CG model of the USS Enterprise-D is first used to recreate the scene. 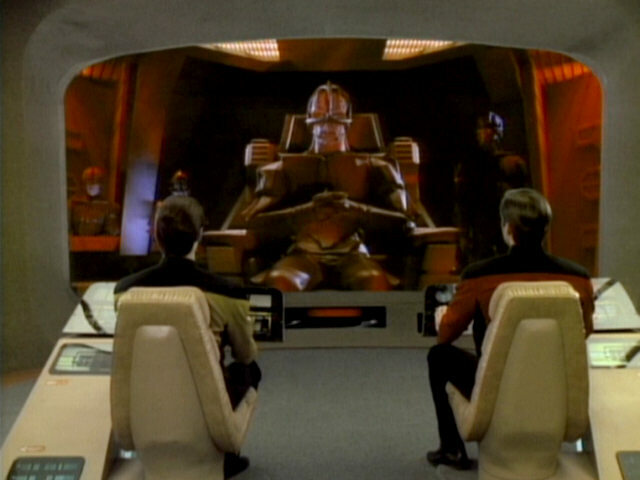 The large set piece behind the away team on the surface of Valo II was originally created for "Who Watches the Watchers" as the reactor of the duck blind seen in that episode. 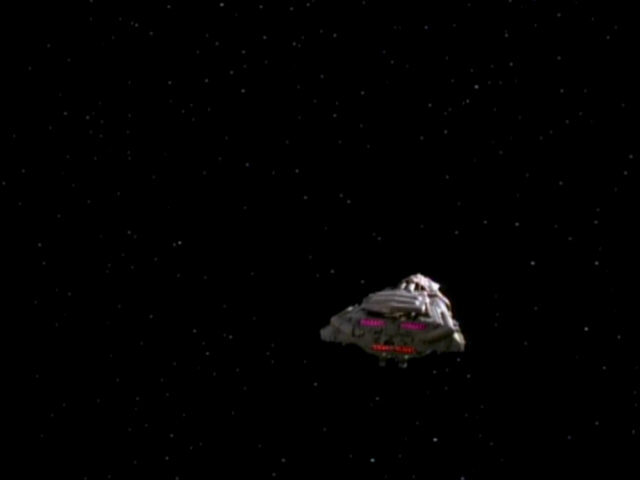 It made an earlier reappearance on Gamma Hromi II in "The Vengeance Factor". 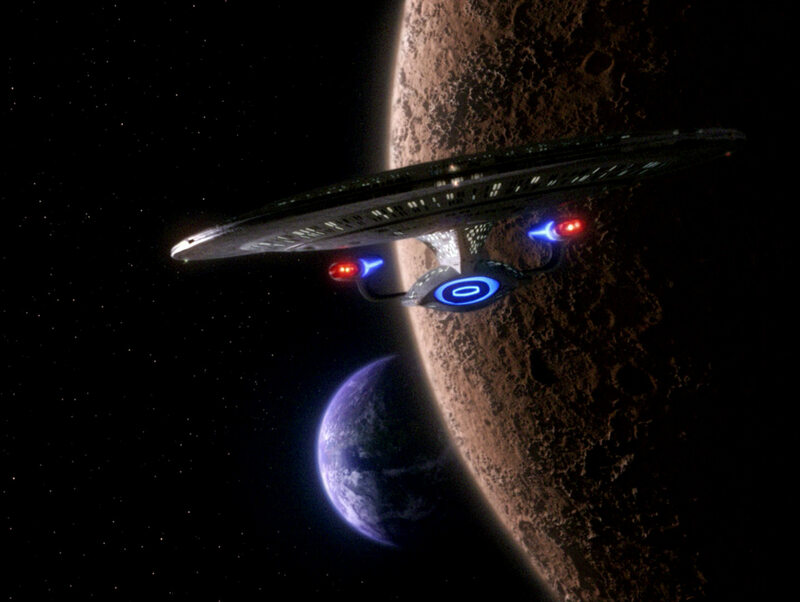 Factor" The set piece in HD. 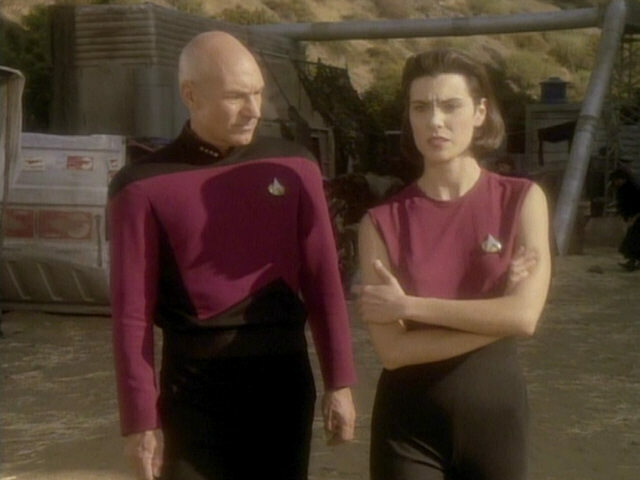 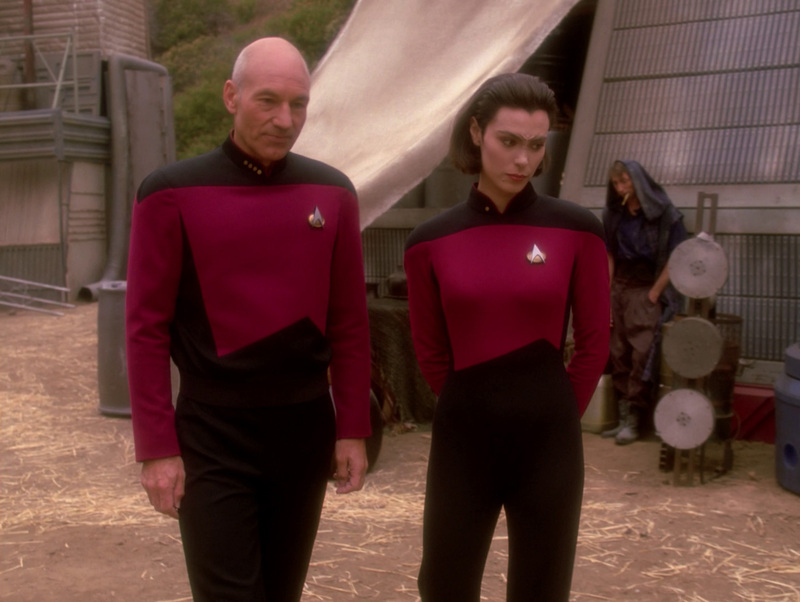 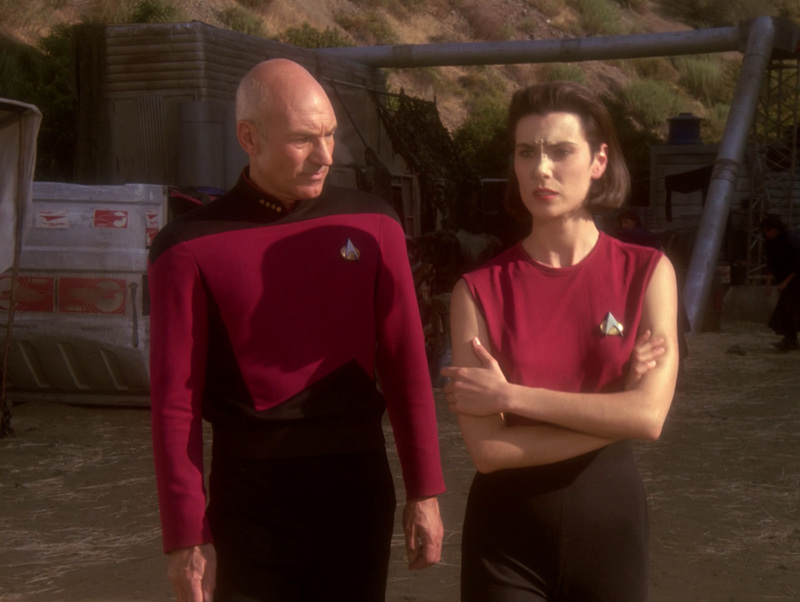 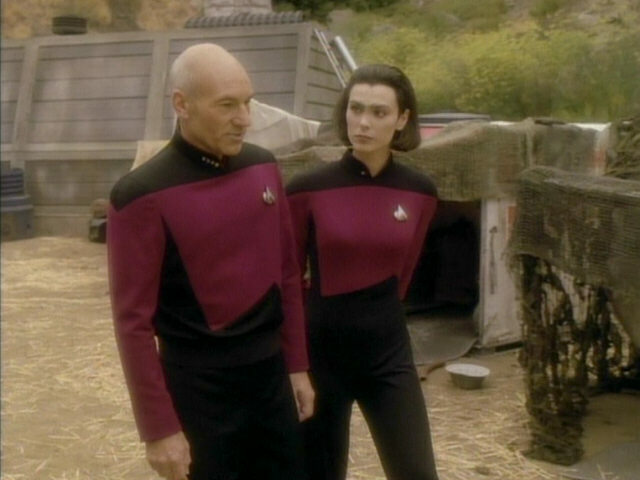 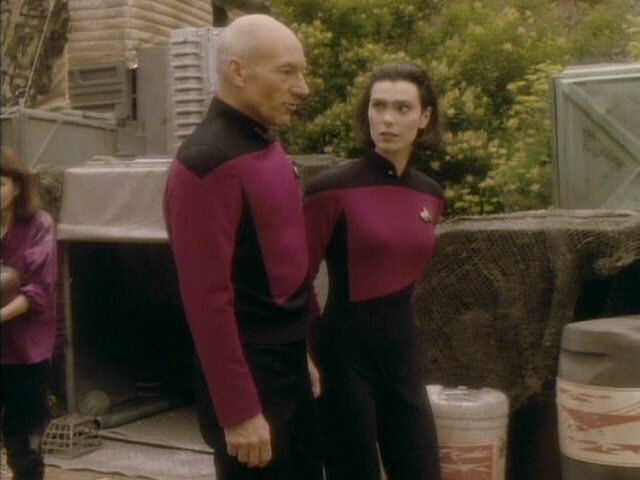 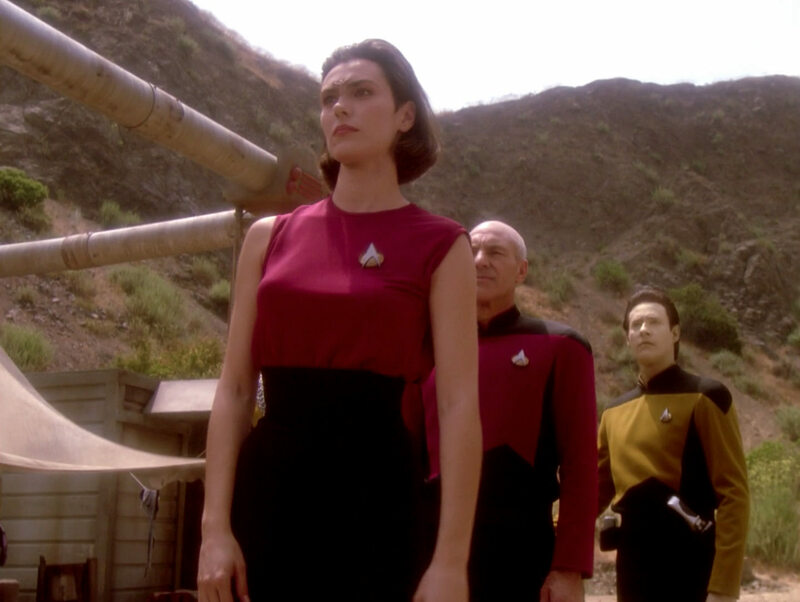 This is the first time a Starfleet undershirt is seen on TNG. 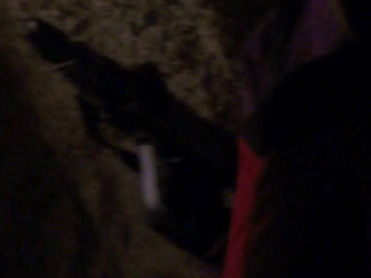 Ro's undershirt in HD. 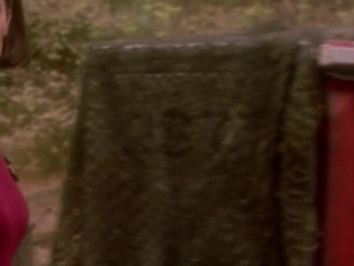 Some interesting alien or Bajoran cargo labels are seen in this episode. 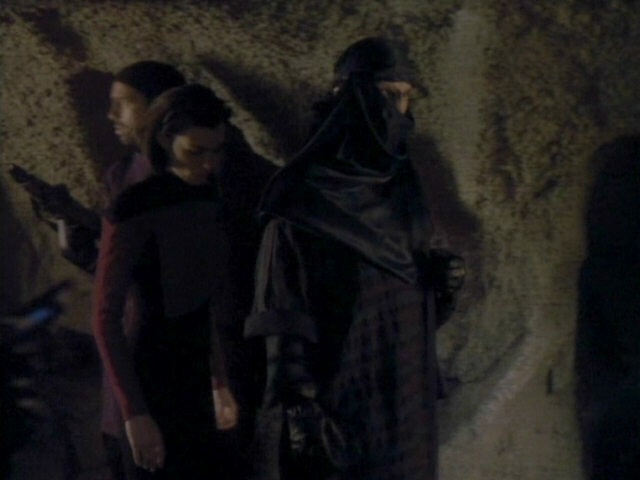 The labels do not feature the Bajoran language, as it hadn't been invented yet. 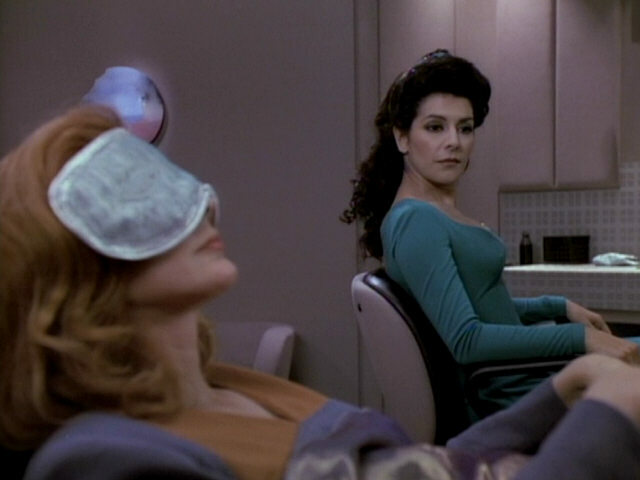 Bajoran writing was first seen in the DS9 pilot episode "Emissary". 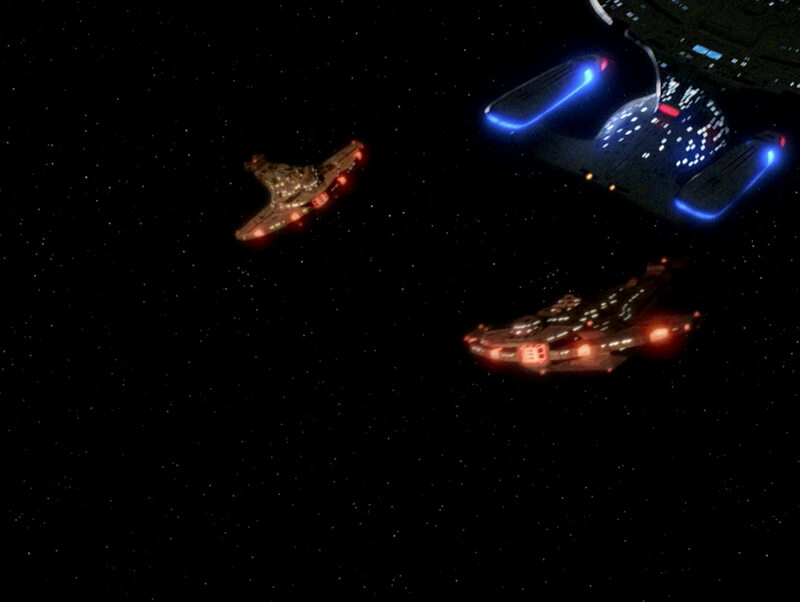 The labels in HD. 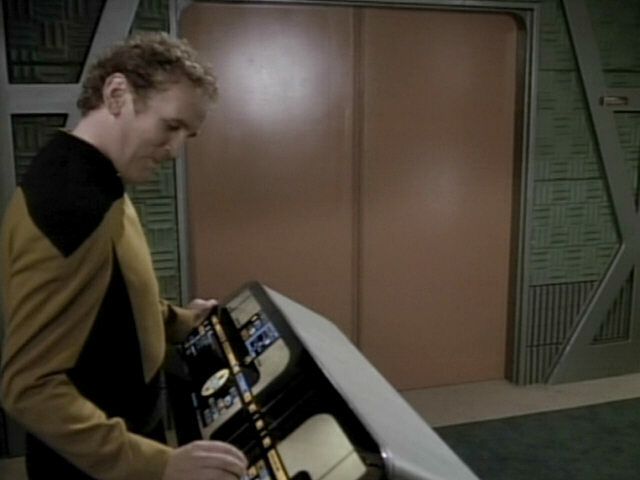 The small pyramid-shaped games on the Ten Forward tables are rarely seen as up close as here. 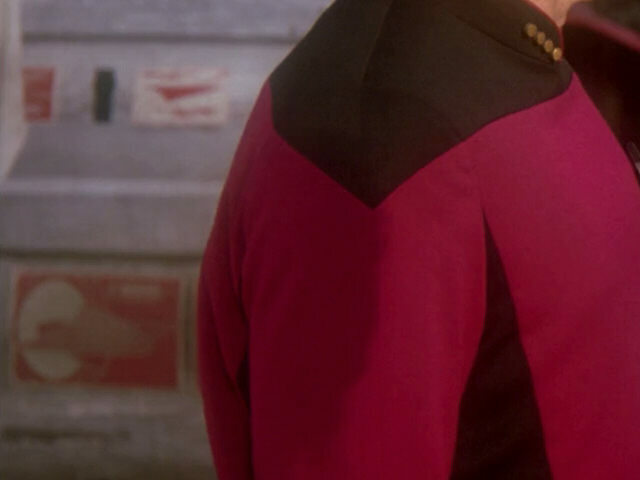 Even in HD, the text on the side of the game is not legible. 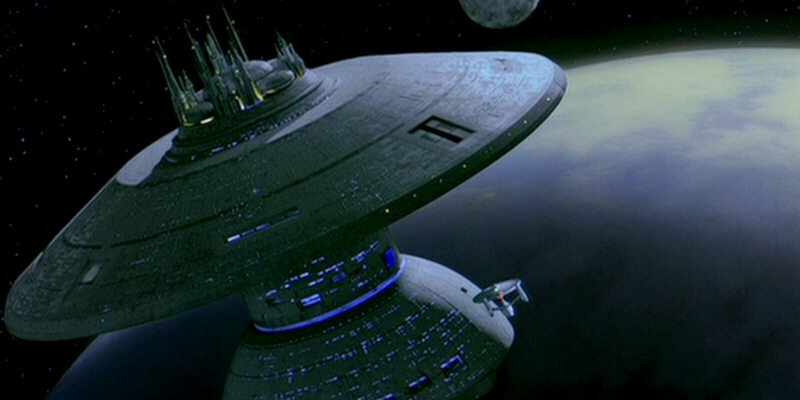 After "Star Trek VI: The Undiscovered Country" had finished filming, the old junior officers' quarters were destroyed and a completely new set was built. 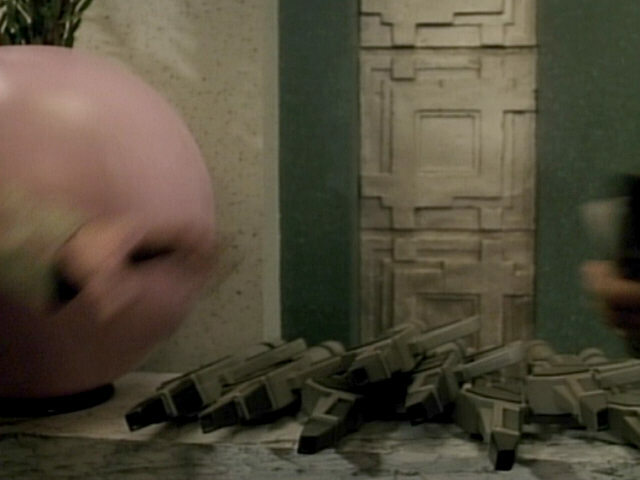 This set could be accessed from three doors, all connected to the large corridor set. 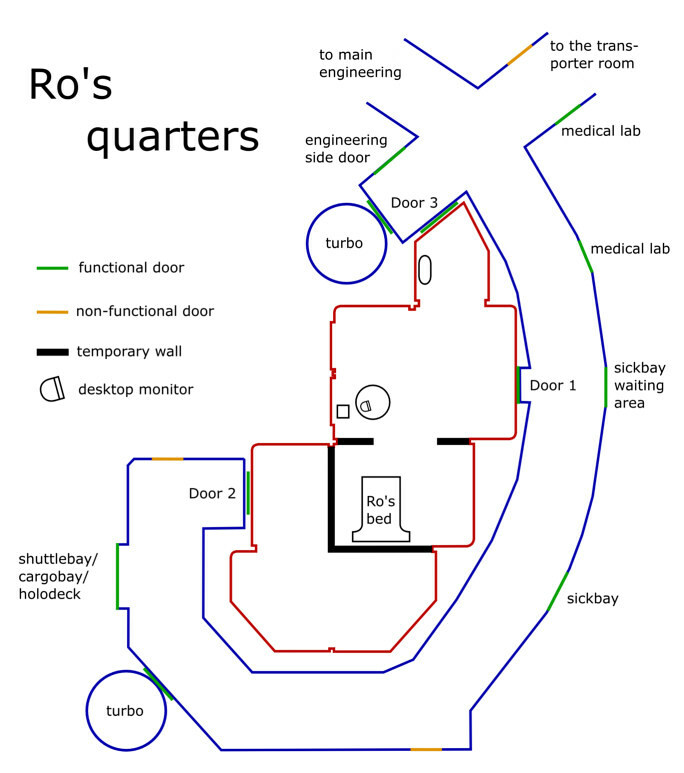 Ro is seen entering her quarters through a completely new door, which was not part of the old quarters set. 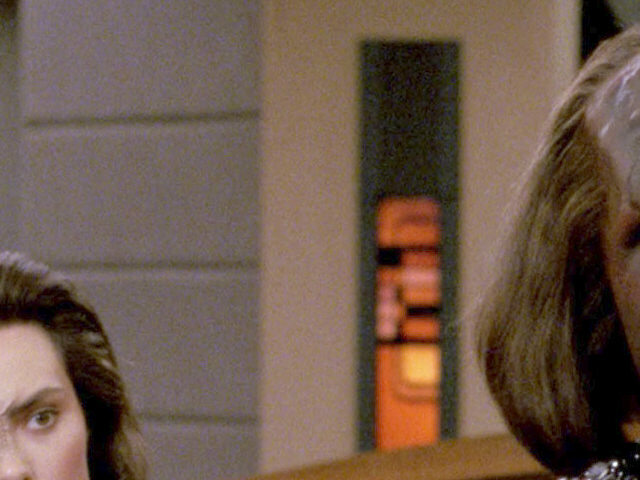 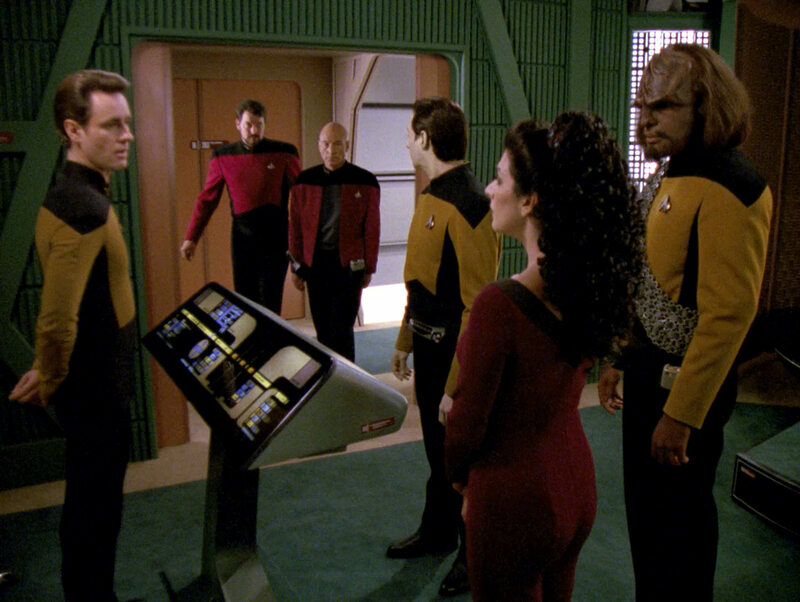 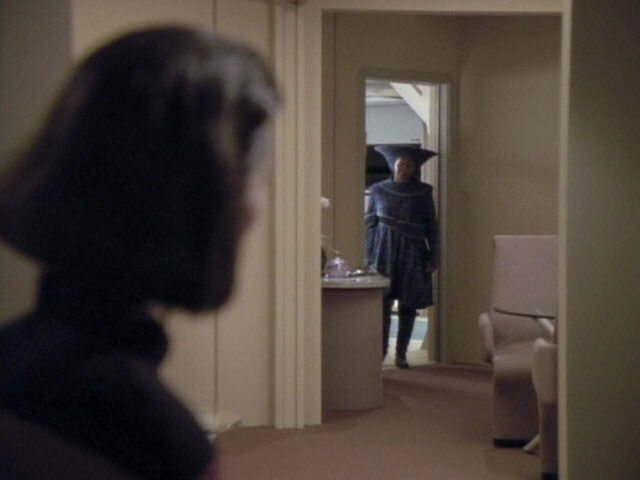 This door is located in the short alcove with a turbolift access, opposite the longer corridor leading to the transporter room and Troi's office. 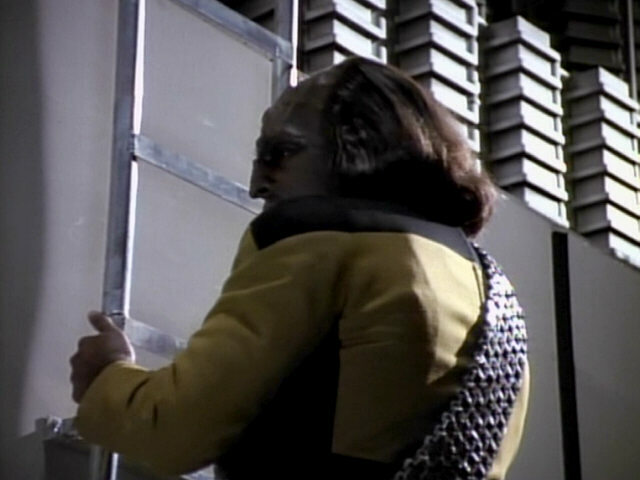 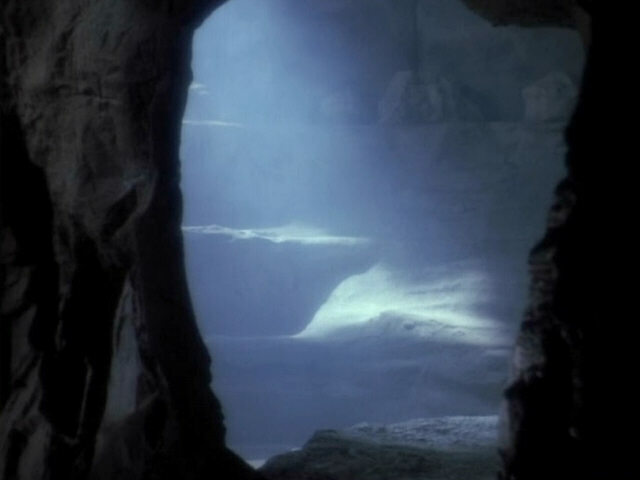 The door (on the left) can be seen from the other side in the screenshot from "Evolution". 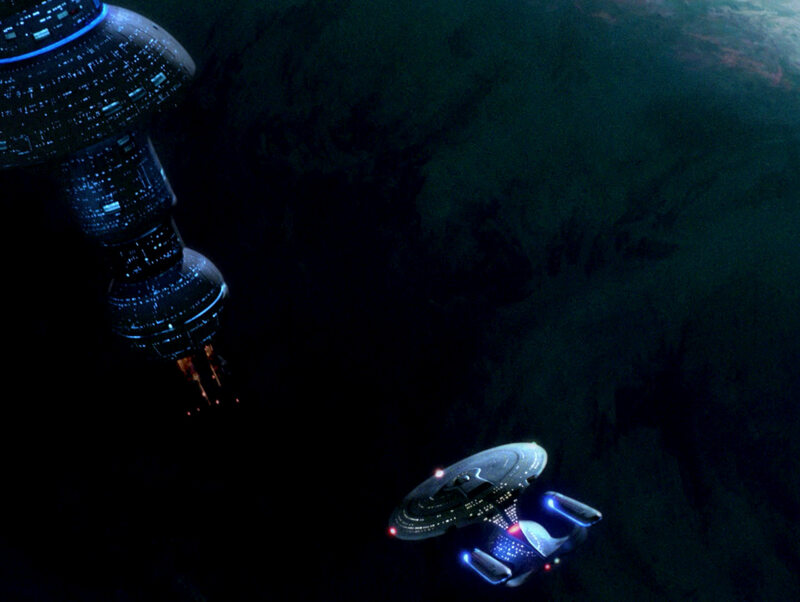 "Evolution" A look at the quarters in HD. 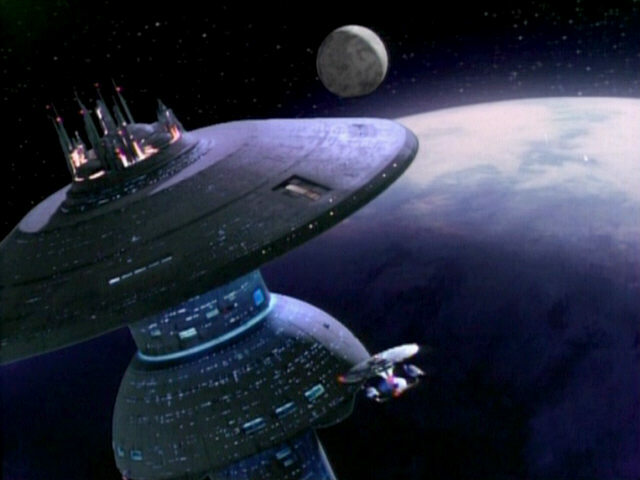 The USS Enterprise-D in orbit of the third moon of Valo I. 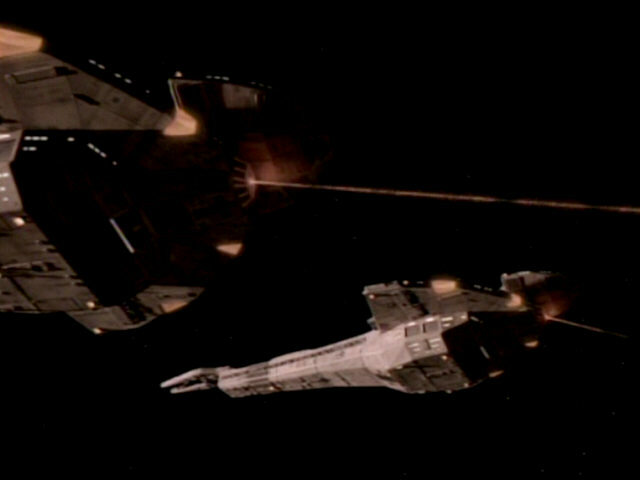 The footage of the ship was originally created for "Redemption I", using the four-foot model. 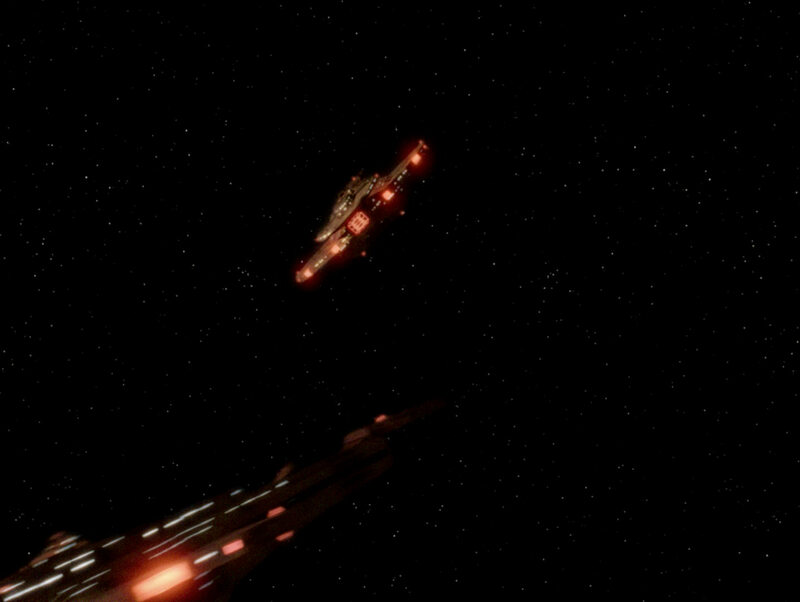 "Redemption I" The shot of the ship and the new CG planet in HD. 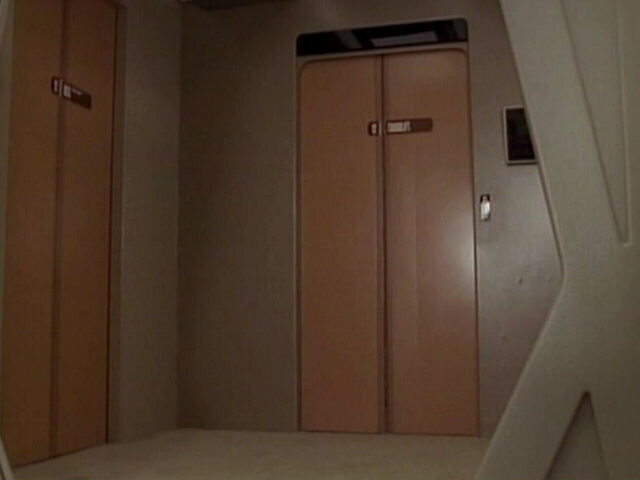 The comparison shot from "Family" shows that the wall covering of the transporter room was changed between seasons. 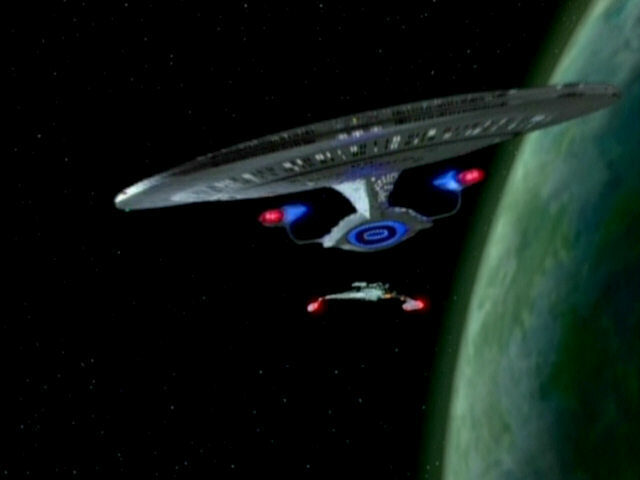 When the set was redressed as the USS Enterprise-A transporter room between seasons 4 and 5, and entirely different material was used. 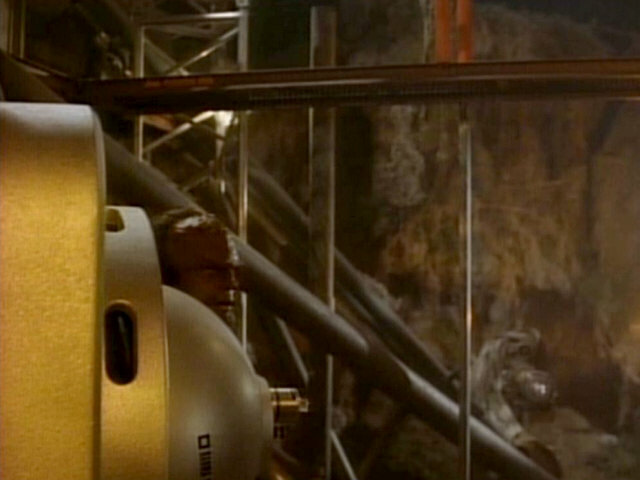 We can see the metallic leg of some equipment on the lower left. 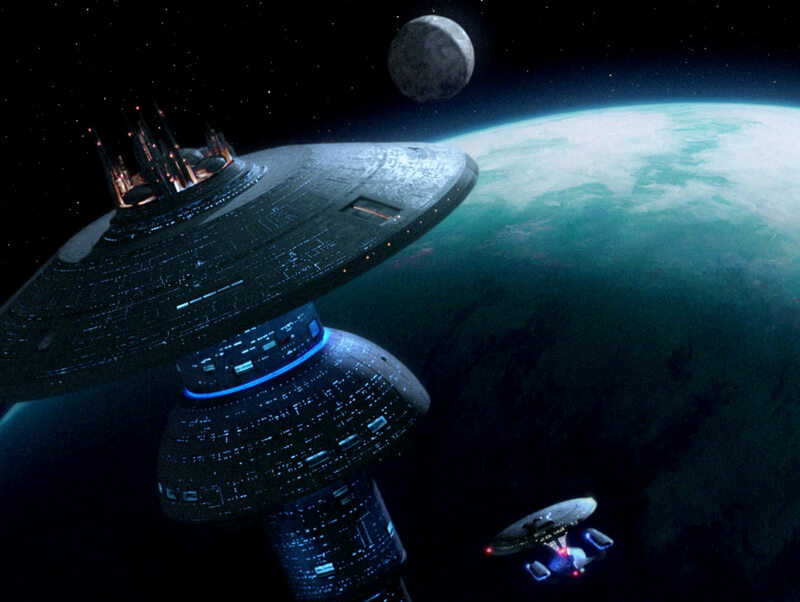 "Star Trek VI" A good look at the set in HD. 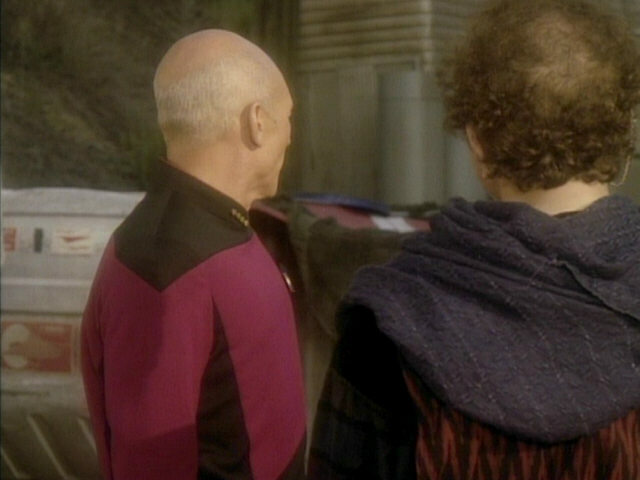 The equipment is even better visible. 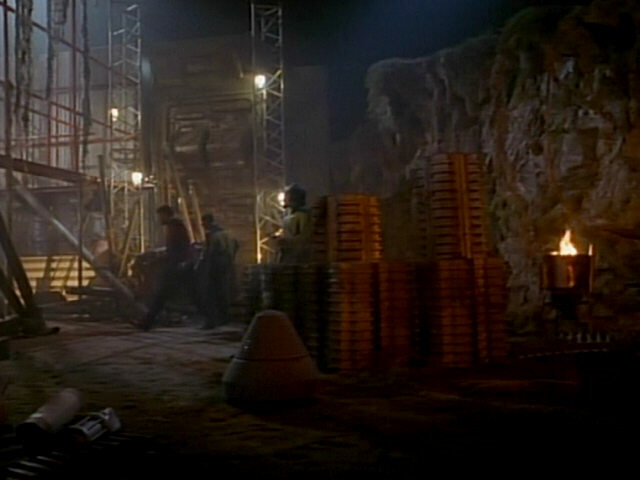 The caves on the third moon of Valo I look remarkably similar to other caves seen in earlier episodes of the series, like the ones seen on Beta Agni II in "The Most Toys". 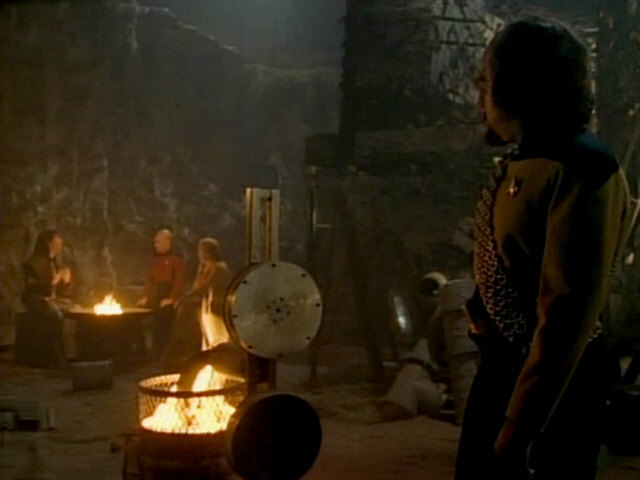 "The Most Toys" The set as it appears in TNG-R.
After the captain's variant of the standard Starfleet uniform first appeared in the previous episode "Darmok", it is seen here again. 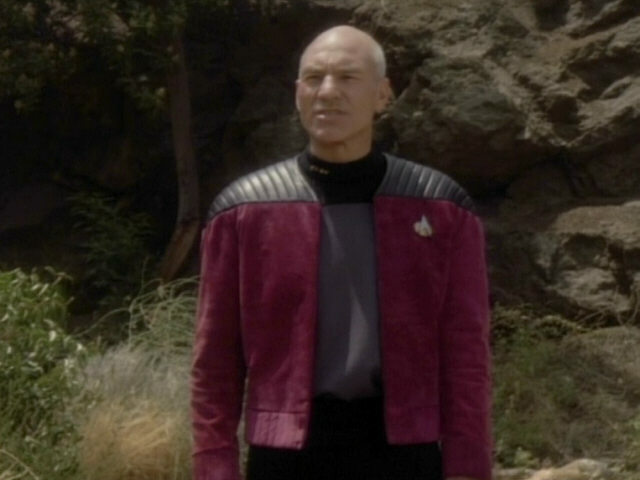 As can be seen, the material that the top part of the uniform jacket is made from was changed for this episode. 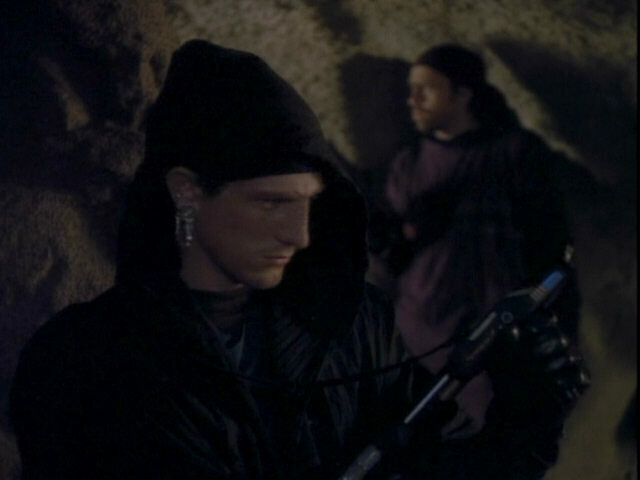 The Bajorans use two types of rifles in this episode. 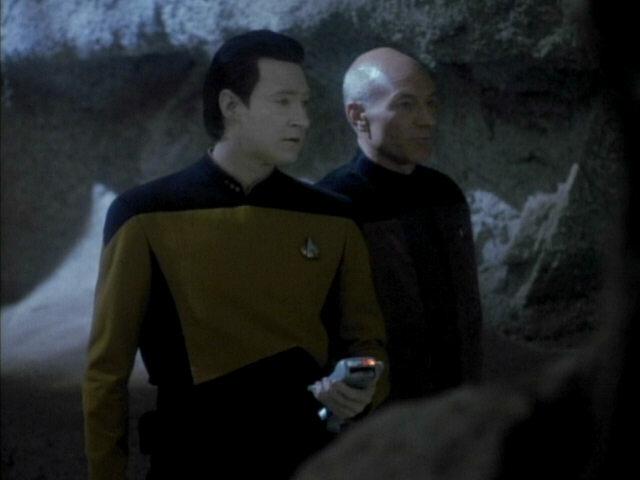 Both were first introduced in the third season. 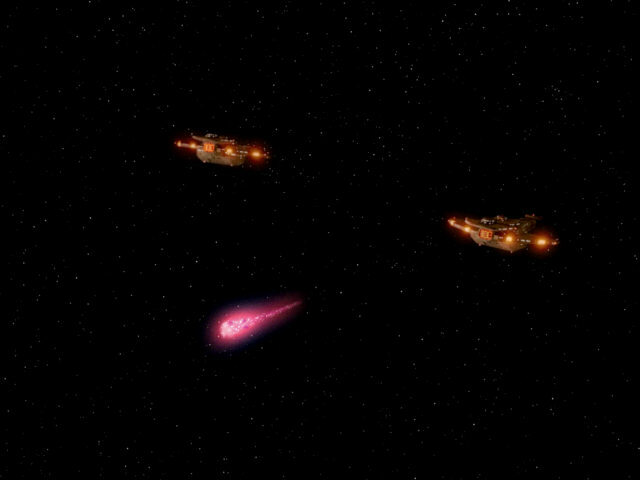 The more prominent one was originally created for the Ansata terrorists on Rutia IV and was seen in "The High Ground". 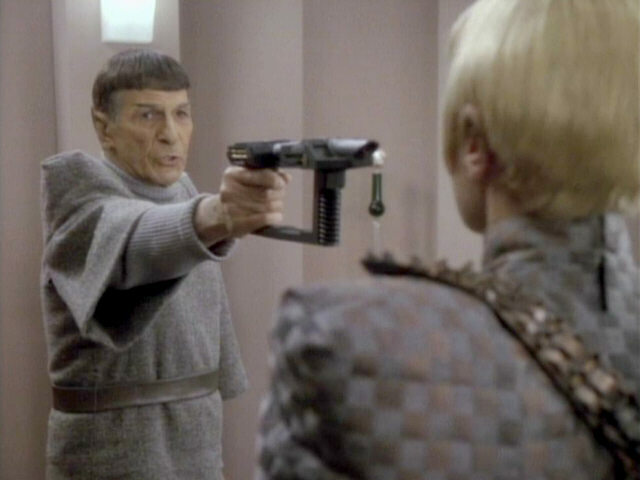 In a few episodes, it would become the standard Romulan disruptor rifle. 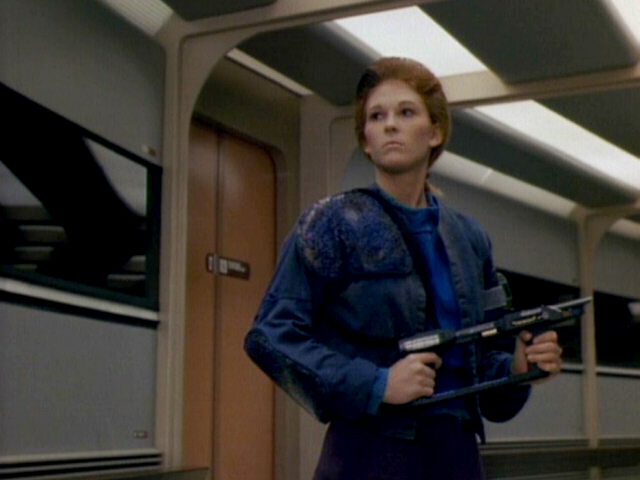 The second rifle was originally created for the Angosians and first appeared in "The Hunted". 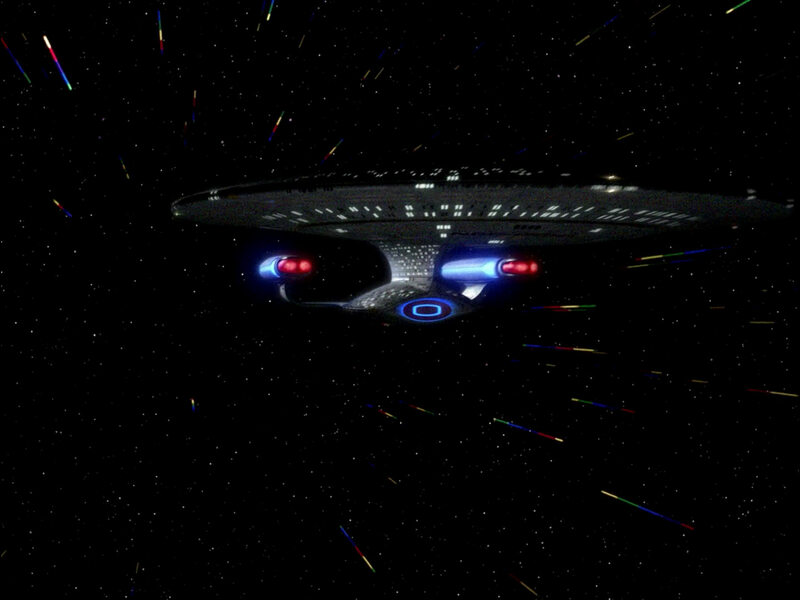 "Unification II" Only after a drastic gamma correction we can see more details of the weapon in HD. 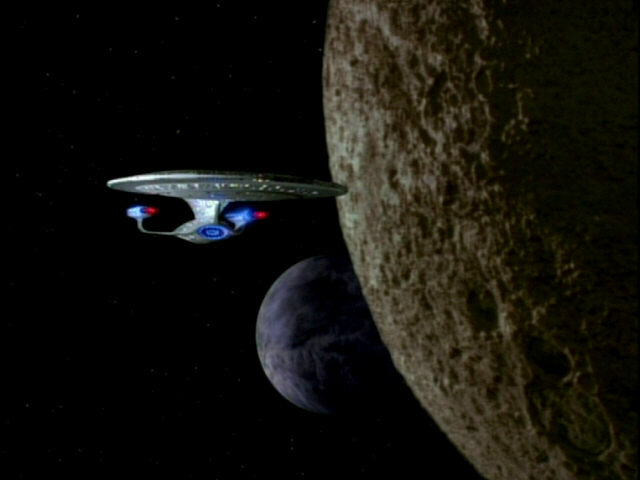 The USS Enterprise-D in orbit of the third moon of Valo I, the latter can be seen in the background. 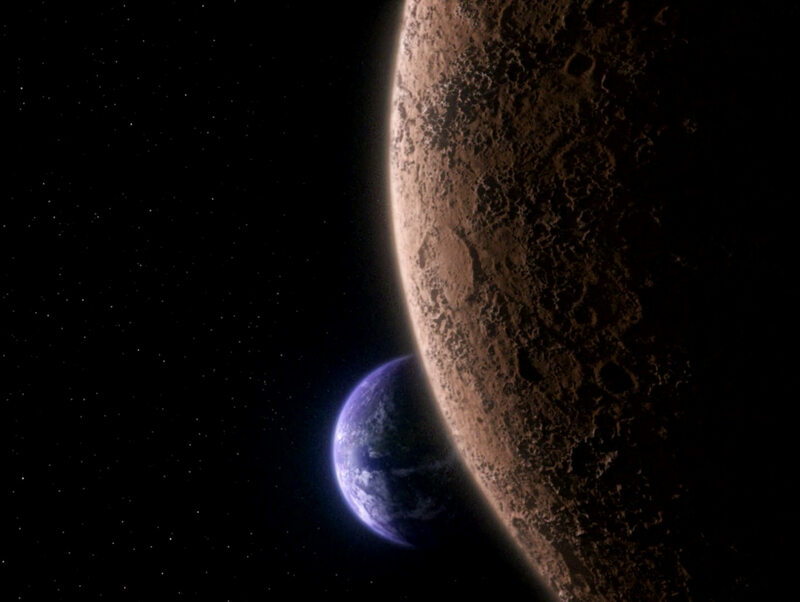 The planet and moon in HD. 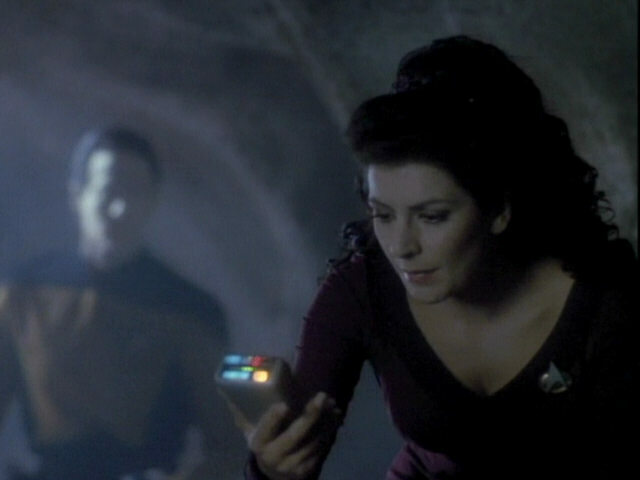 The top part and the sides of the yellow alert indicator seen in the background is covered with a black, non-reflective material in this scene. 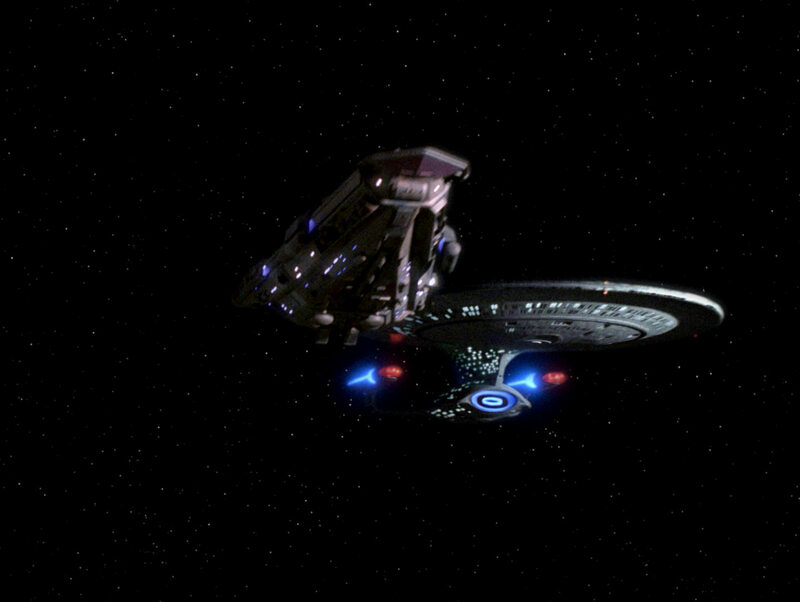 Only after enhancing gamma considerably we can still see the piece of cardboard in HD. 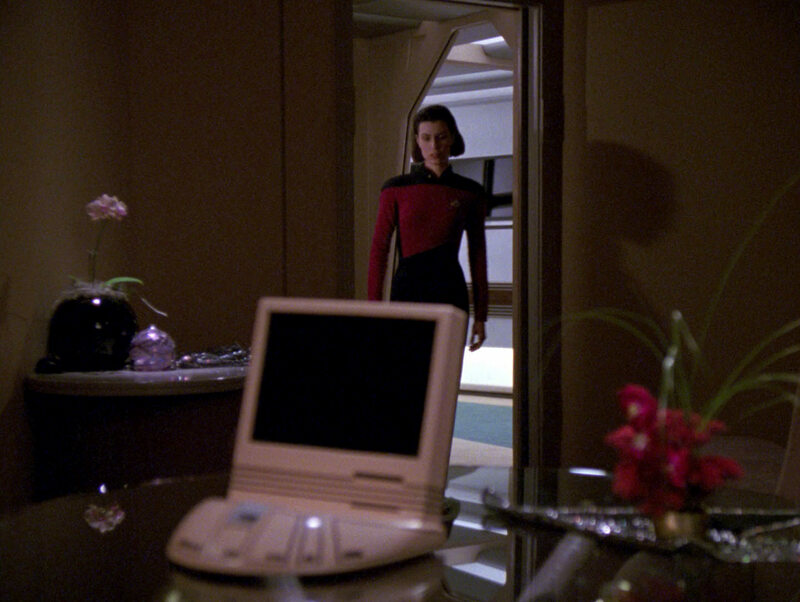 Another look at the redesigned junior officers quarters showing the new door connecting to the corridor set and Ro Laren's bed. 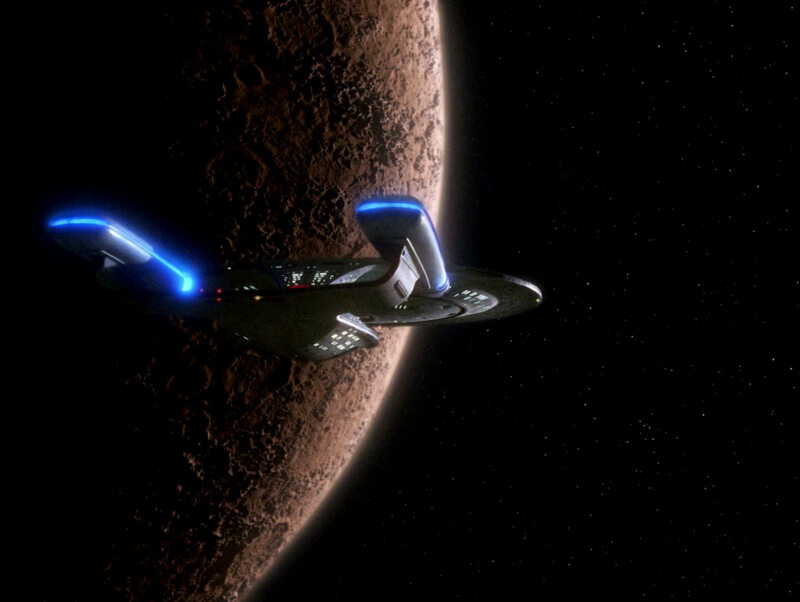 The comparison screen cap from season 4's "The Host" that the bridge remained virtually the same after season 4. 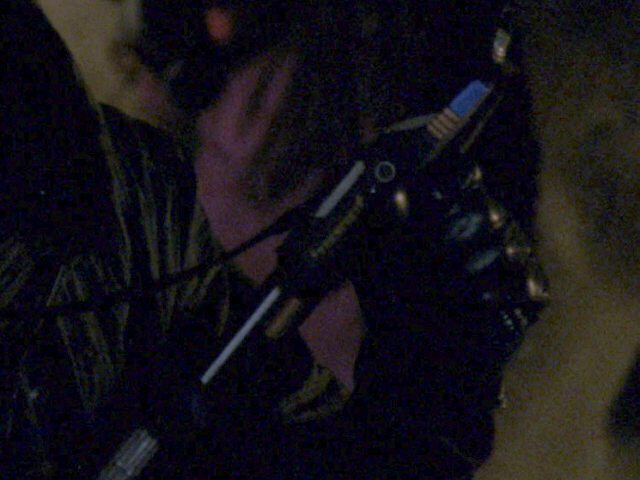 "The Host" The shot in HD. 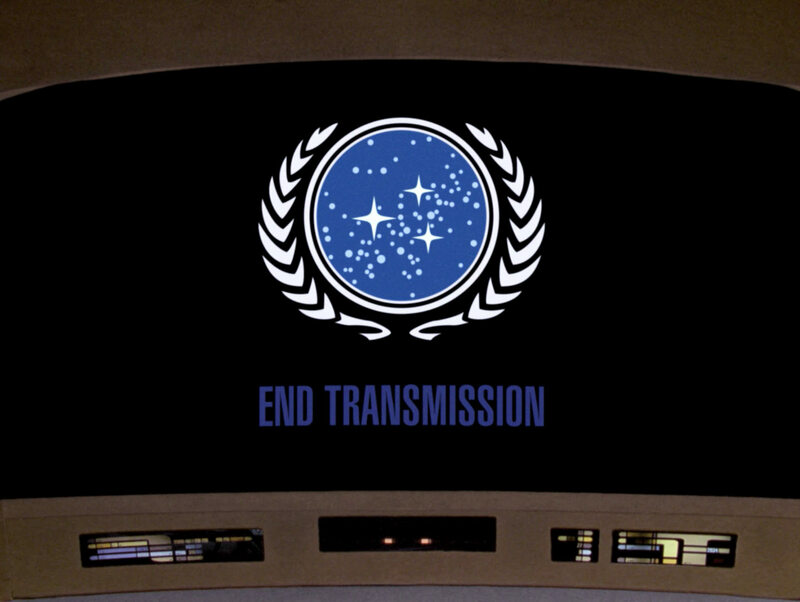 The Federation logo and "End Transmission" text. 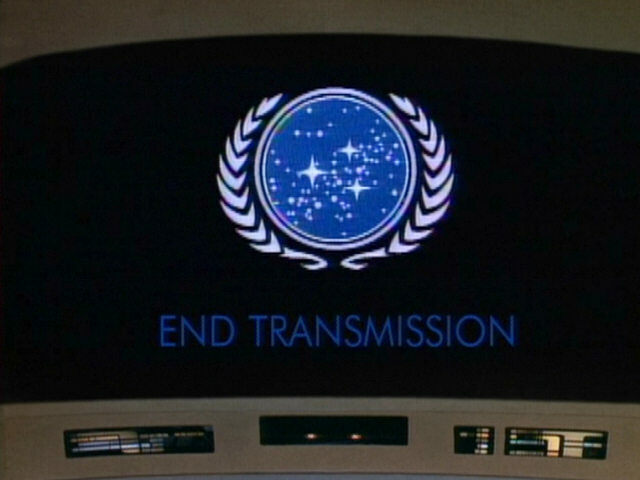 The emblem was recreated and slightly modified for the remastered version of the episode. 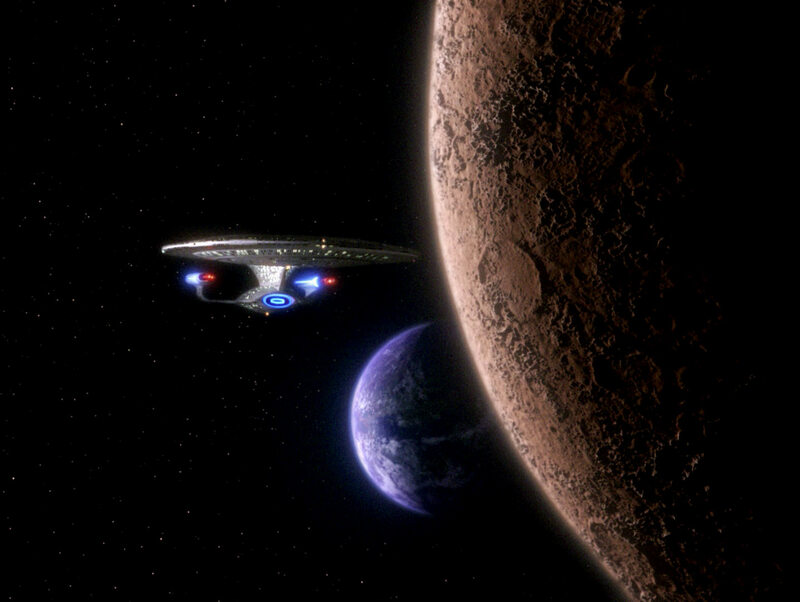 The shot of the USS Enterprise-D leaving orbit of a planet was originally created for "Redemption I" where the ship leaves orbit of Qo'noS. 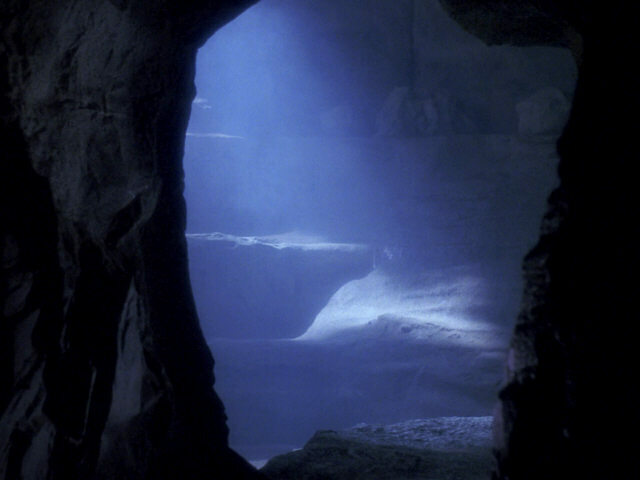 "Redemption I" The shot in HD. 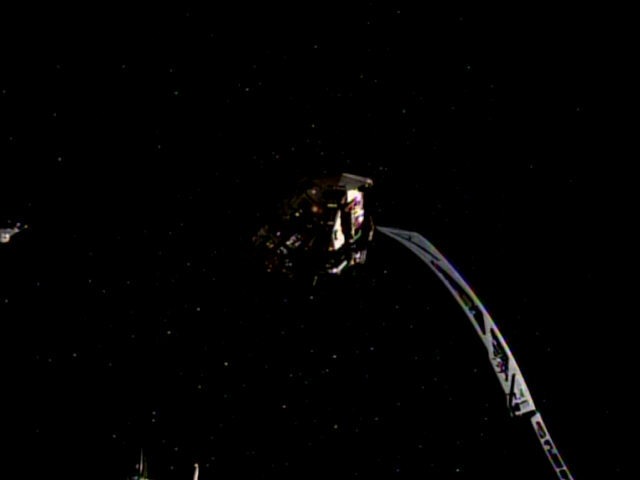 Valo I and its third moon. 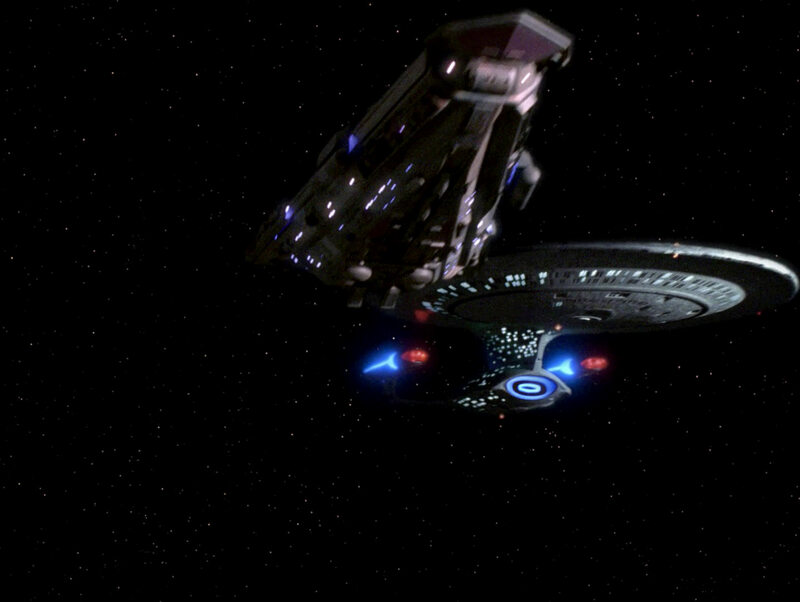 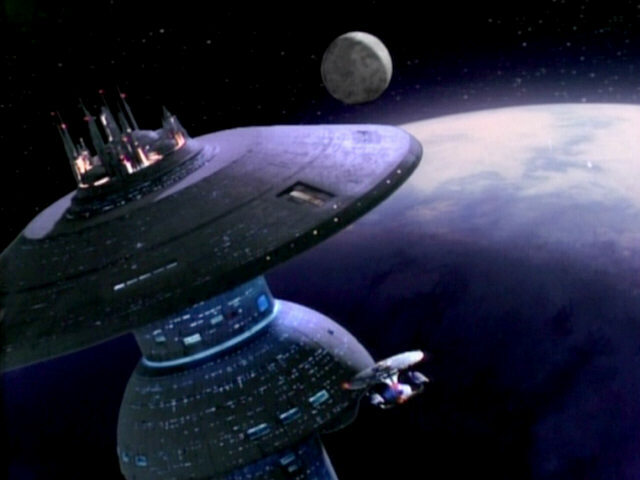 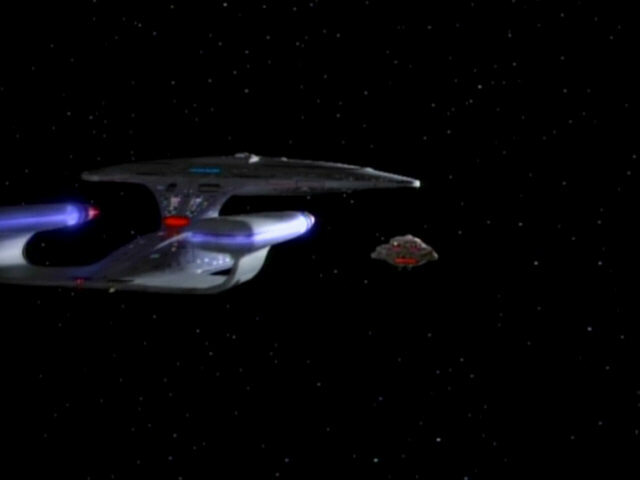 The Bajoran Antares-class carrier leaves orbit of the third moon of Valo I. 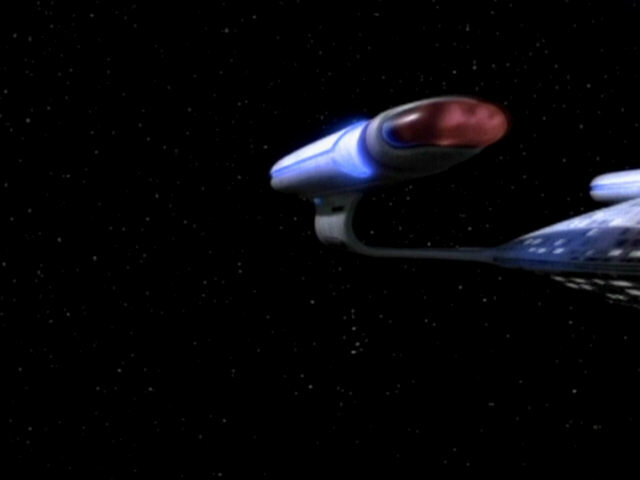 The model is a redress of the Jovis, which itself was a redress of the Husnock warship. 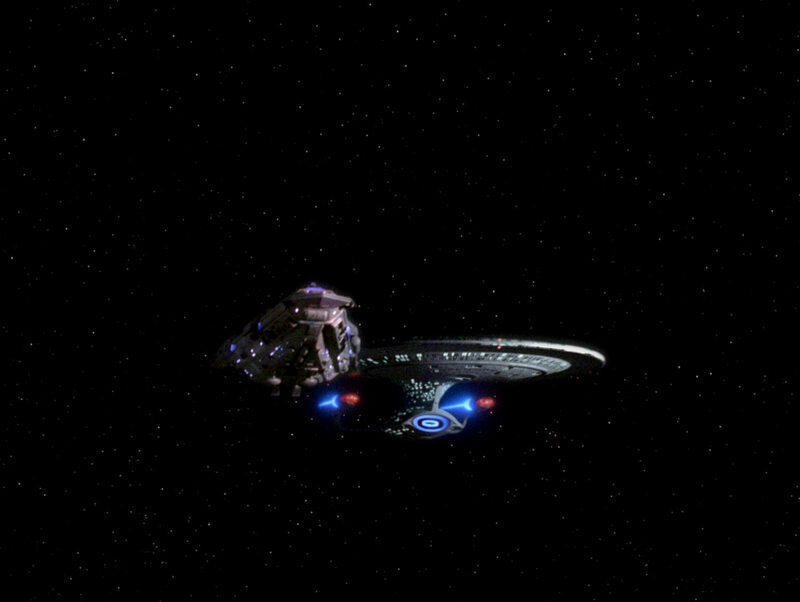 The Antares Class(es) The Bajoran ship in HD. 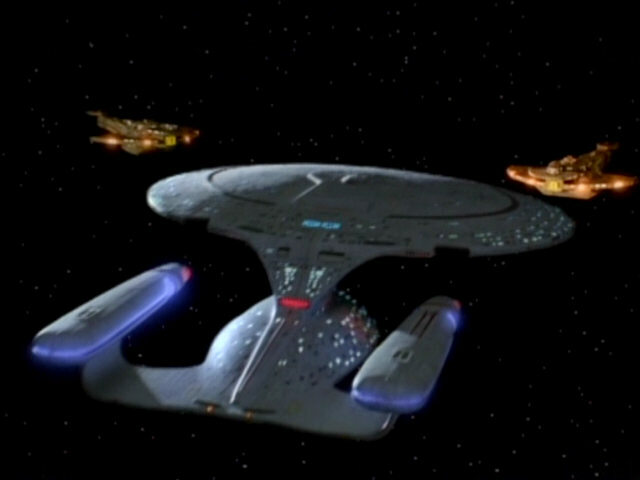 The aft shot of the Antares-class ship shows that it is a redress of the Husnock ship and the Jovis. 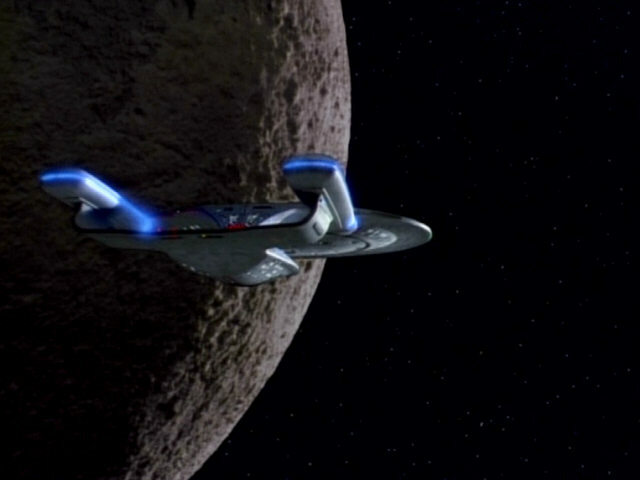 The shot of the USS Enterprise-D slowly flying away from the camera also appears in "Half a Life" and "Redemption I". 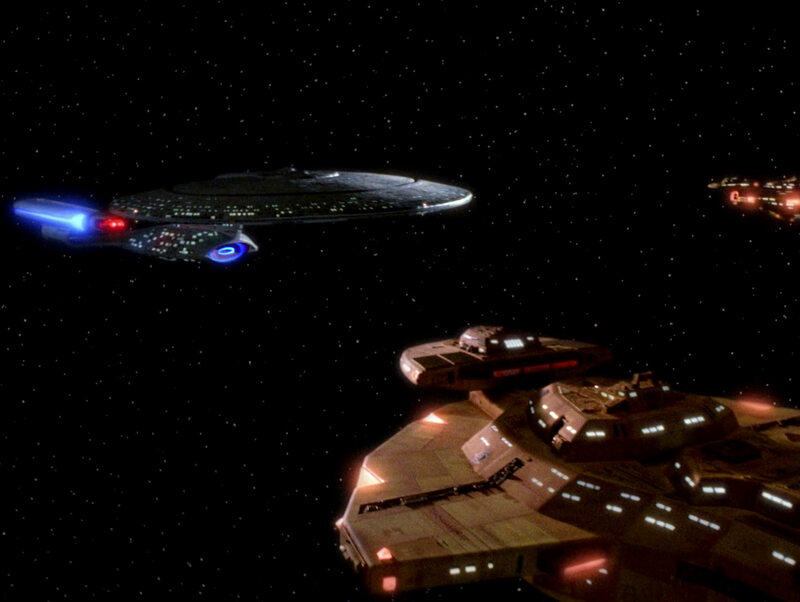 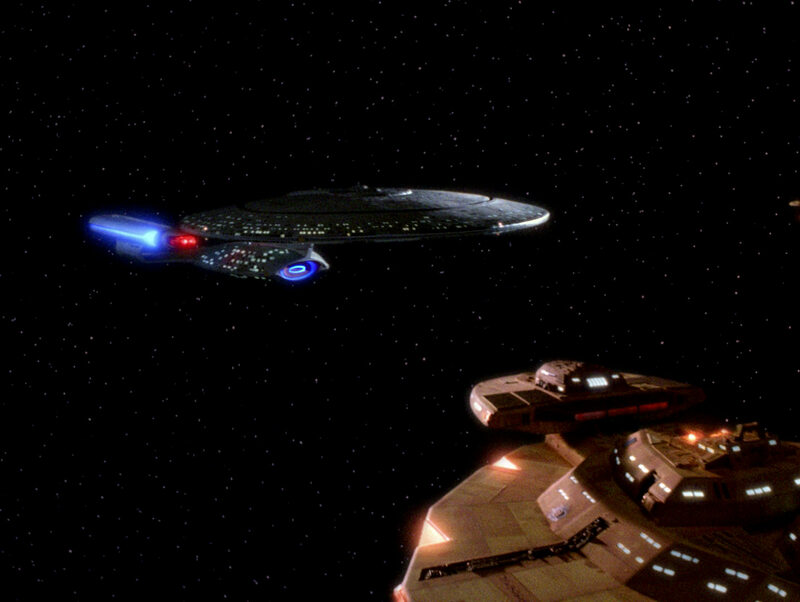 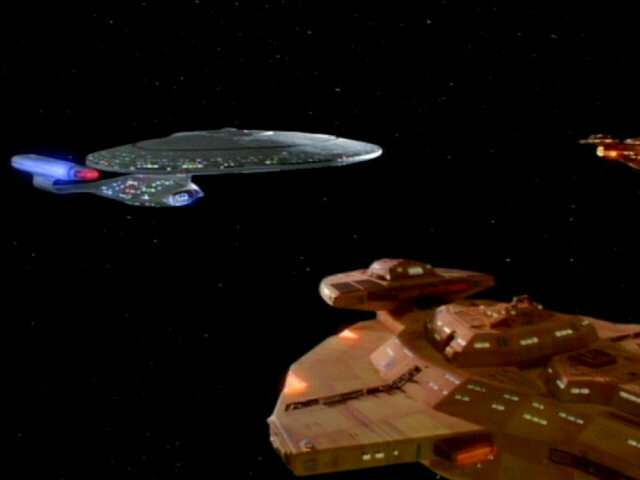 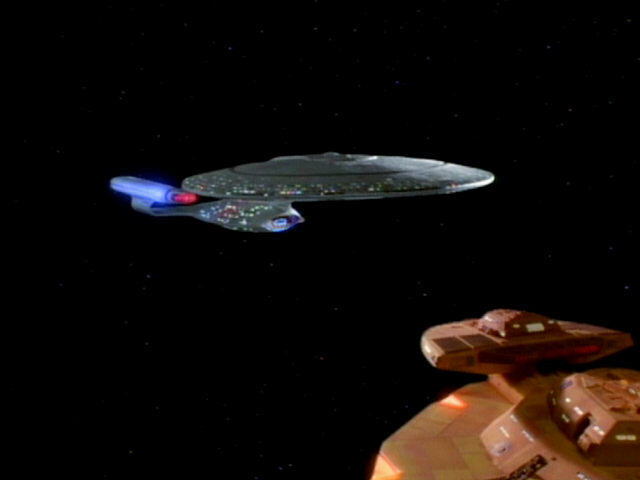 This shot of the USS Enterprise-D flying alongside the Antares-class carrier was originally seen in "Redemption I", where the ship flies alongside a Klingon attack cruiser. 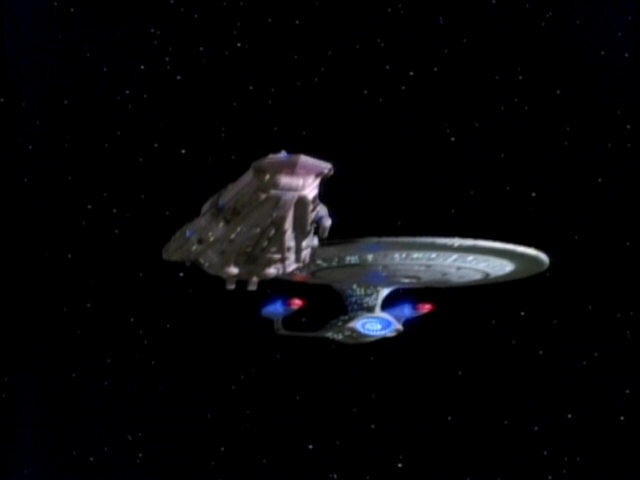 The front section of the Bajoran ship can be seen up close in this shot. 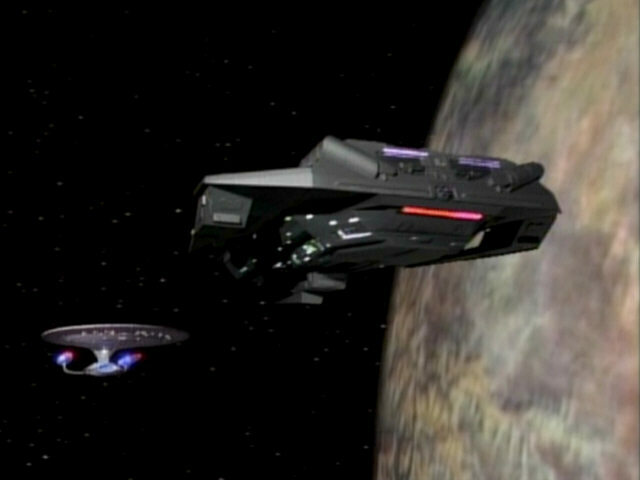 The same model would later appear in countless DS9 episodes as one of two oft-seen Bajoran ship types, beginning with "A Man Alone". 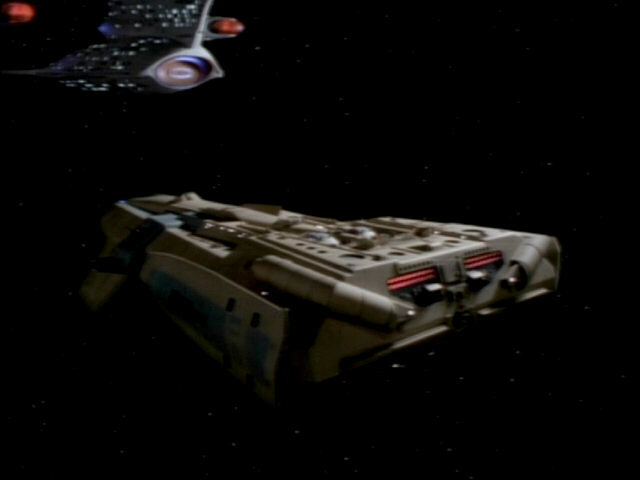 All shots of the two Cardassian Galor-class ships appearing in this episode were newly created, not re-using any footage filmed for "The Wounded". 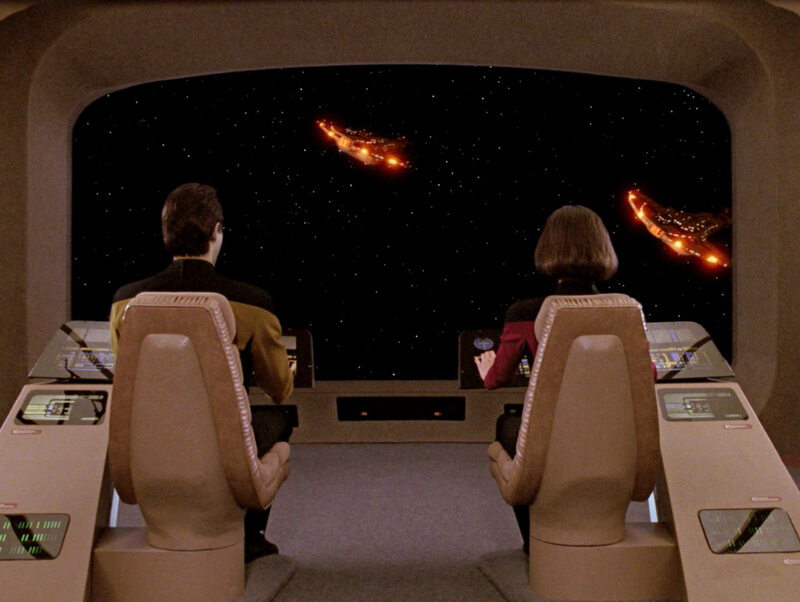 This first shot on the bridge viewscreen is no exception. 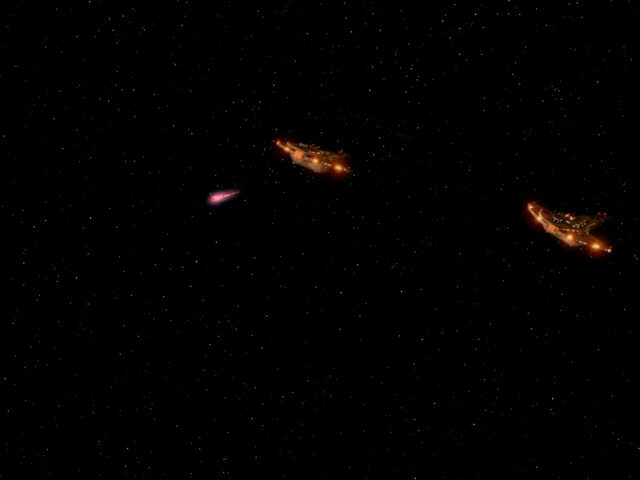 The Galor-class ships in HD. 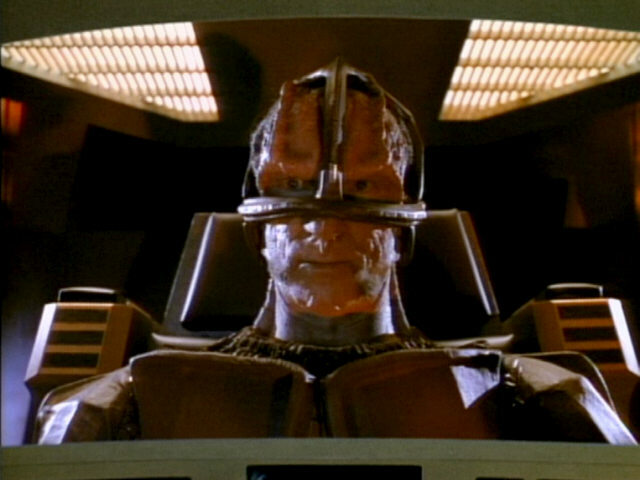 While the Cardassian captain's chair (some stripes were removed and the headpiece was made smaller) and uniform (the helmets are missing) are mostly the same in "The Wounded" and this episode, the bridge set appears to be different. 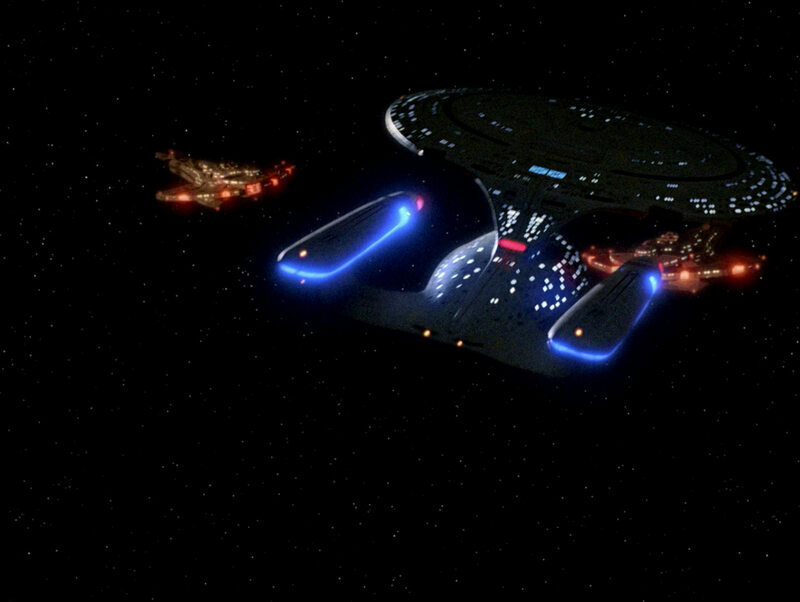 It is painted green and lit much more brightly. 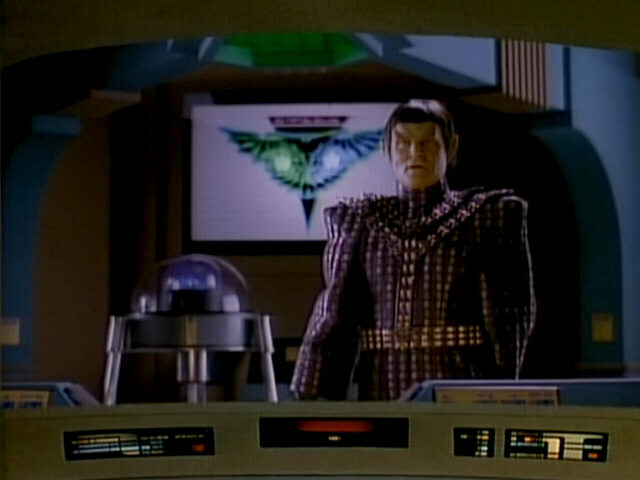 The set is an extensive redress of the bridge of the Romulan Warbird seen in "Data's Day". 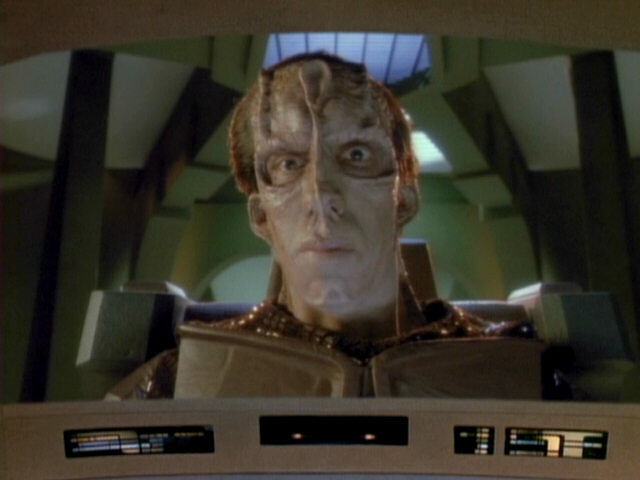 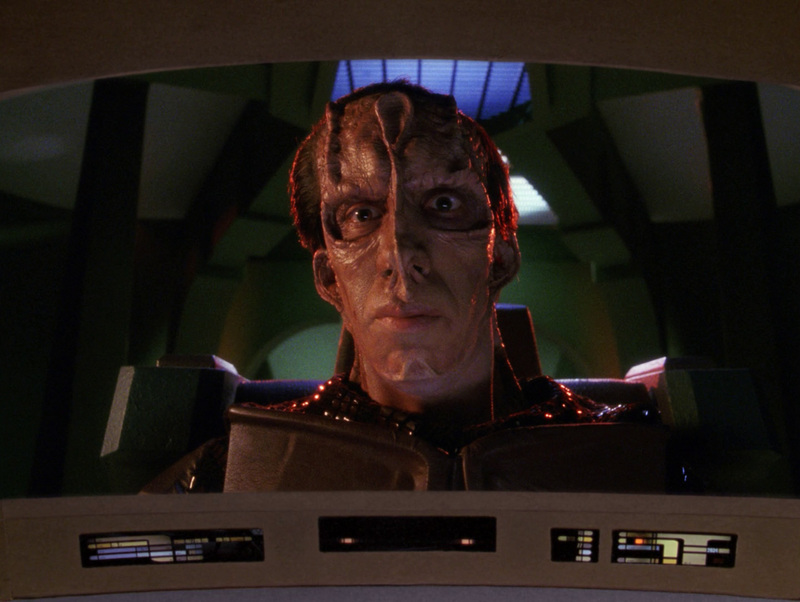 "The Wounded" The Cardassian bridge in HD. 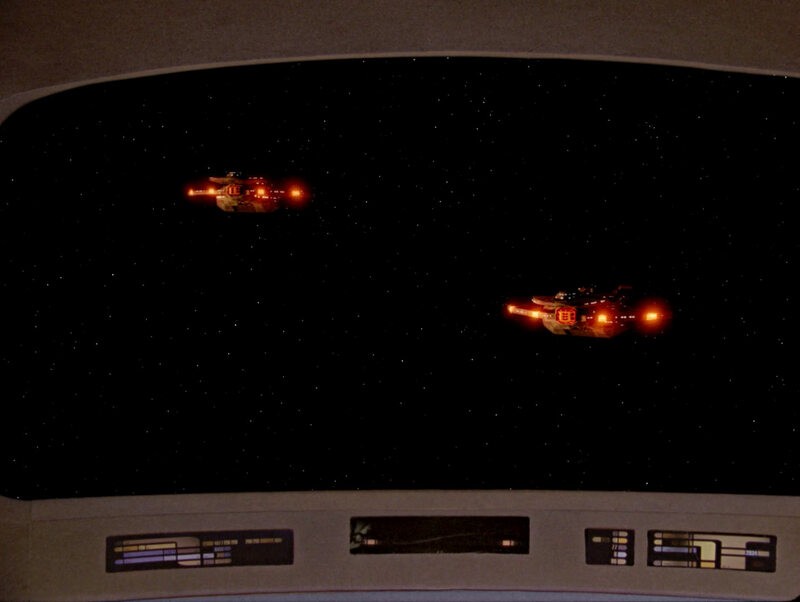 The two Galor-class ships seen on the main viewscreen. 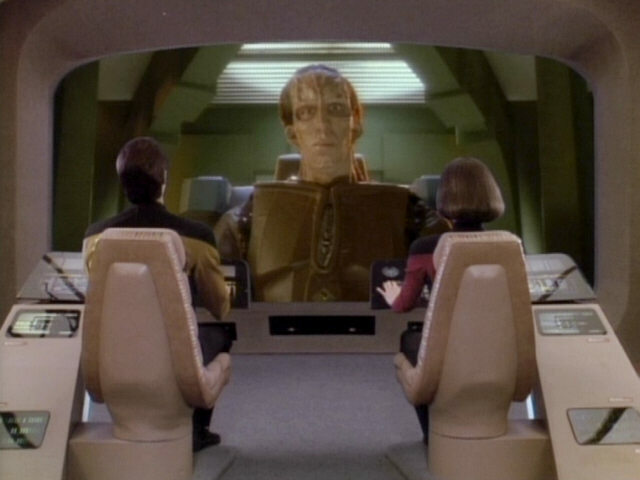 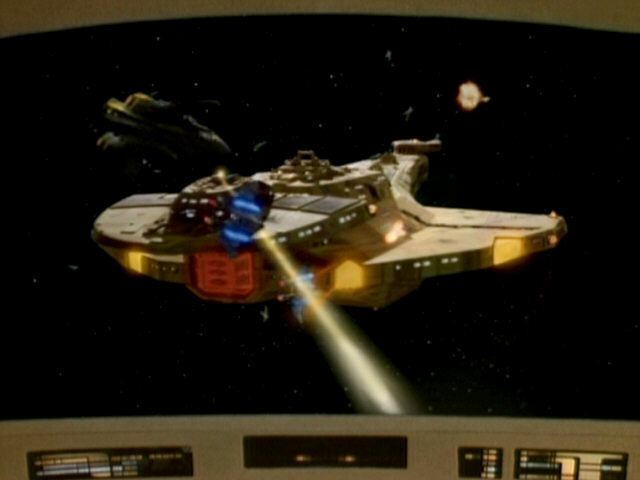 Like in "The Wounded", the deflector of the Cardassian ships is yellow in this episode, while in later episodes the deflector is usually red. 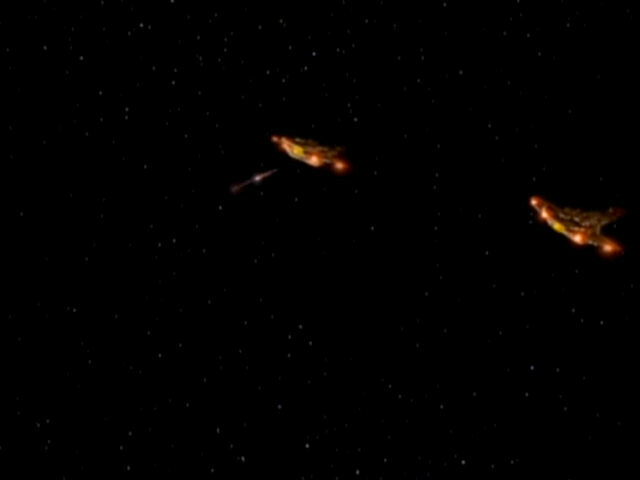 Strike" The Cardassian ships in HD. 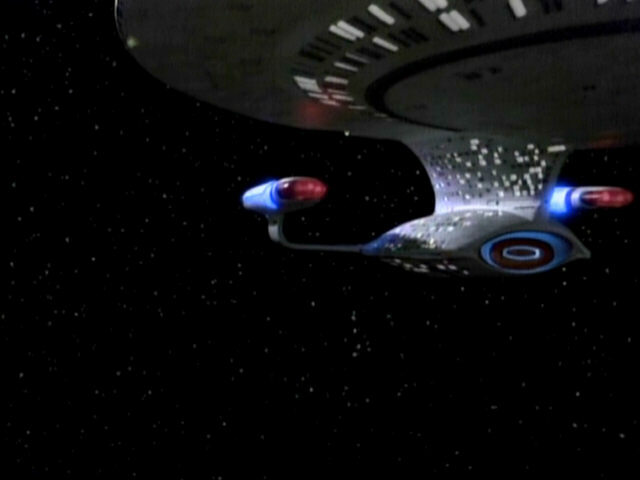 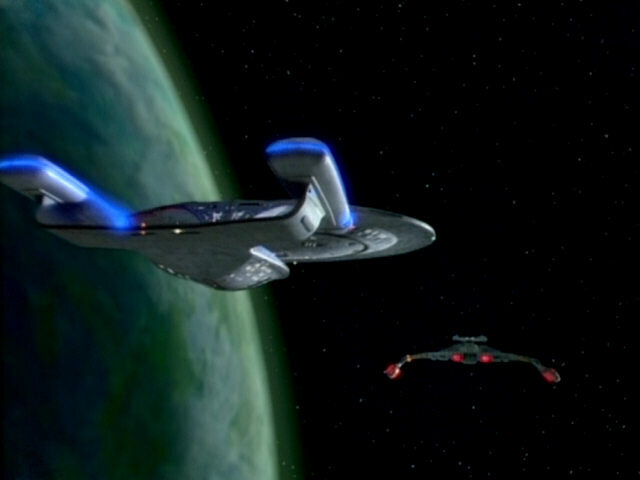 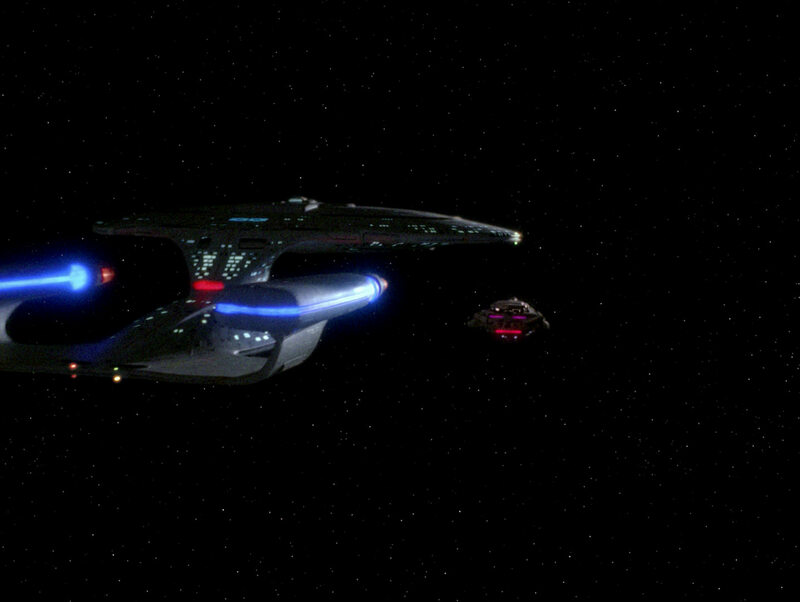 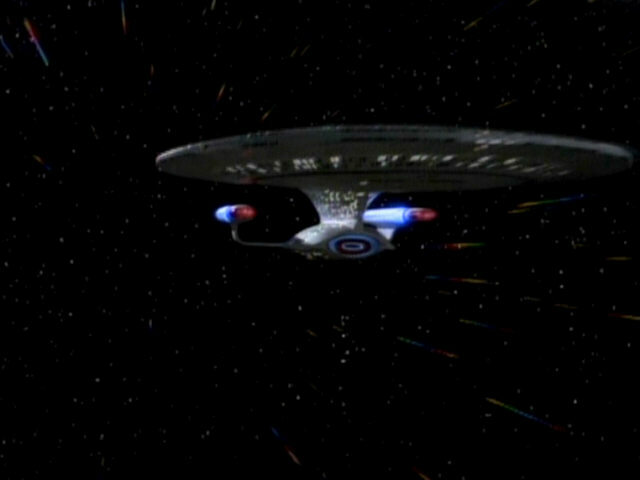 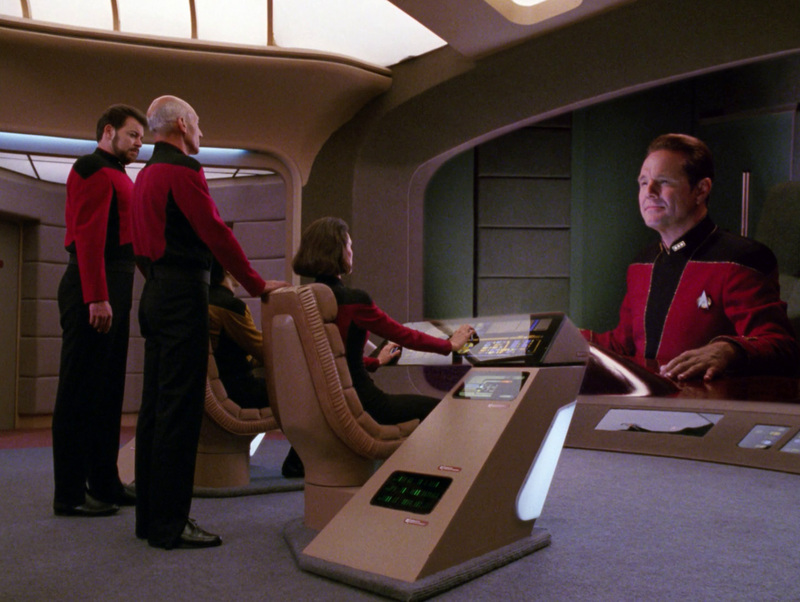 The deflector dishes are now red, which complies with the color seen in later episodes. 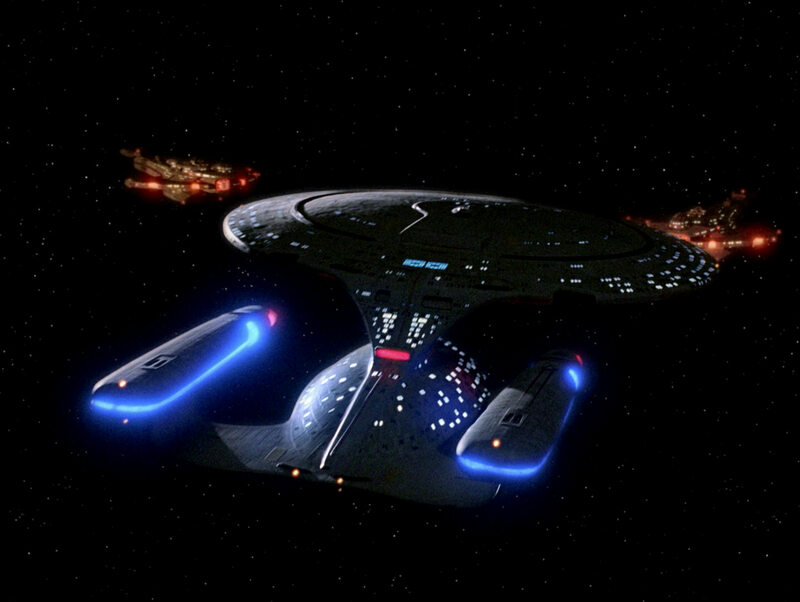 A beautiful new shot of the USS Enterprise-D facing the two Cardassian vessels. 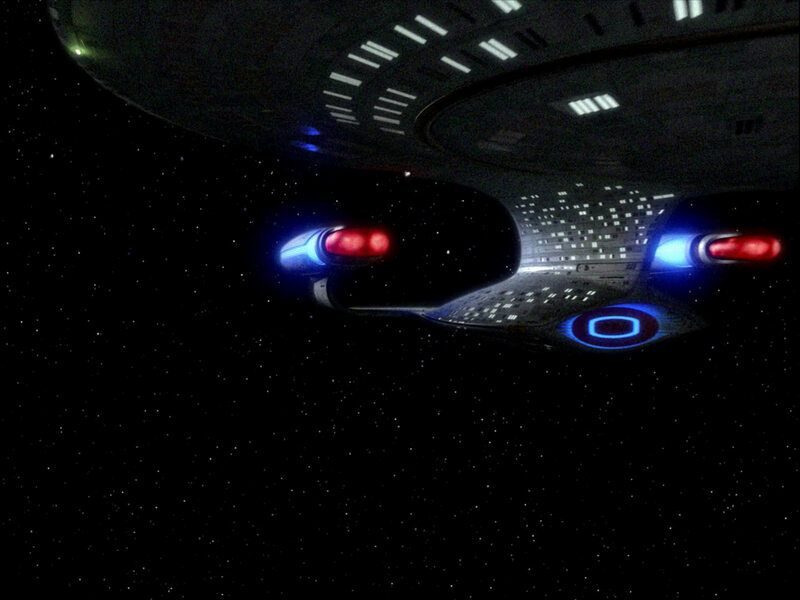 We can also see in HD that the small pyramids on top of the wing tips are now illuminated yellow, an effect that was missing in the SD version. 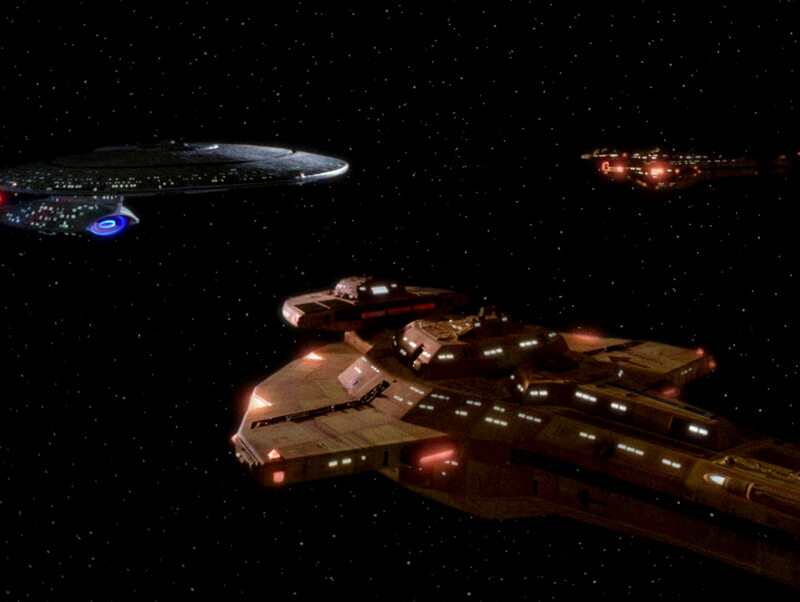 The USS Enterprise-D and the Cardassian ships part ways. 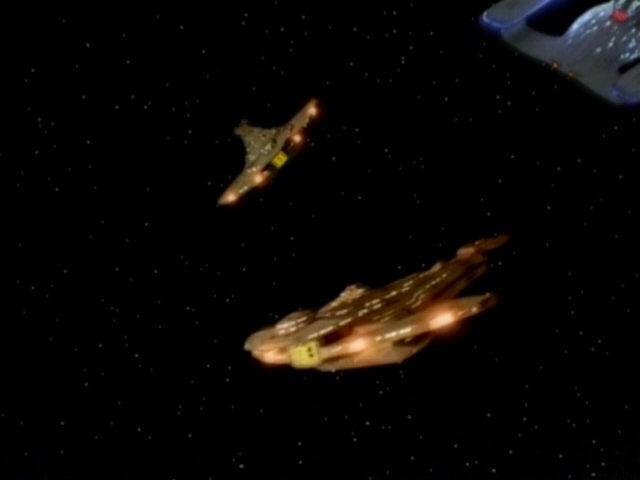 Notice the yellow deflectors of the Galor-class ships. 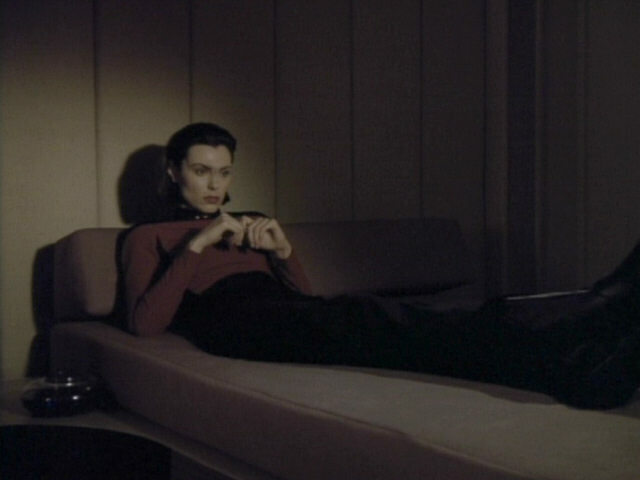 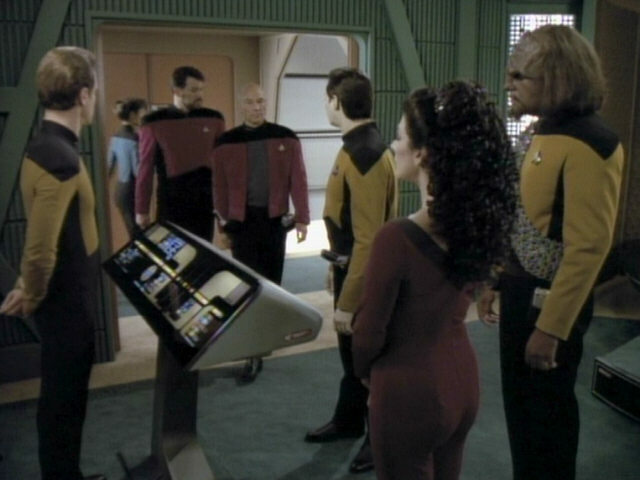 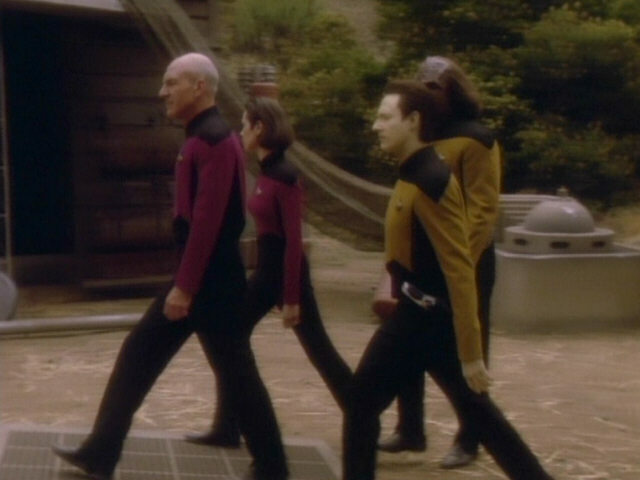 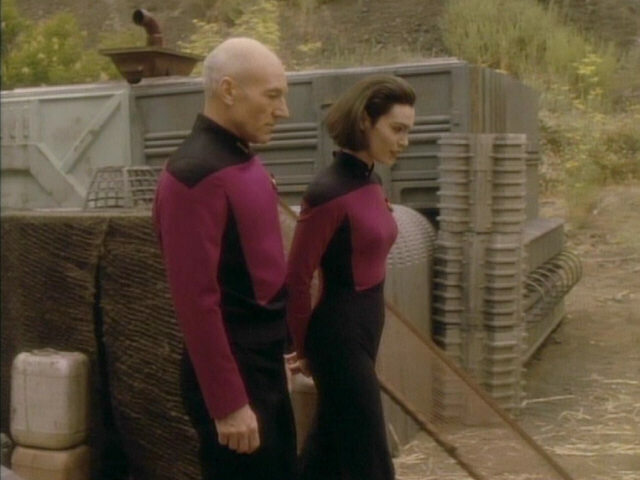 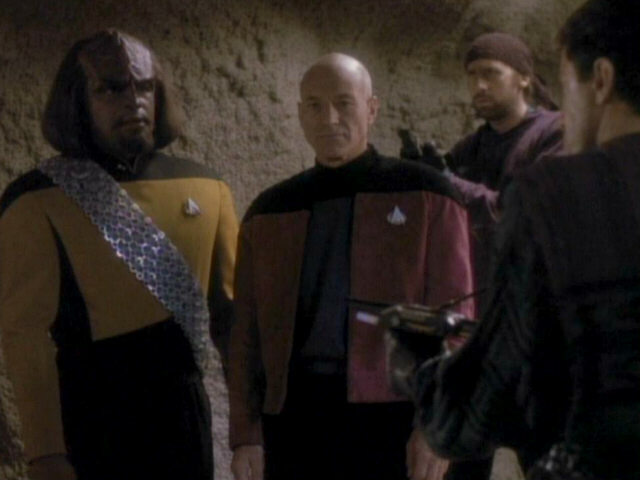 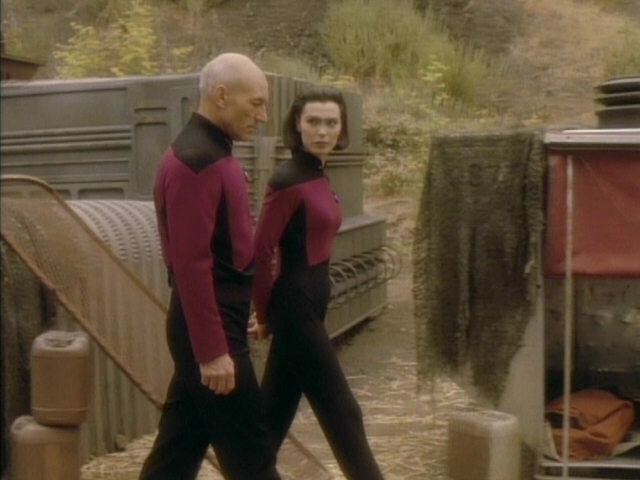 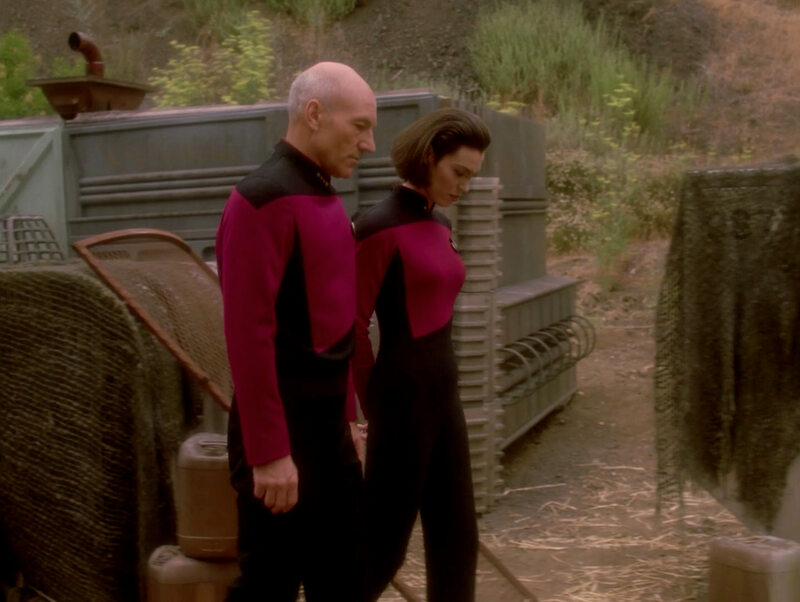 The sequence in TNG-R. 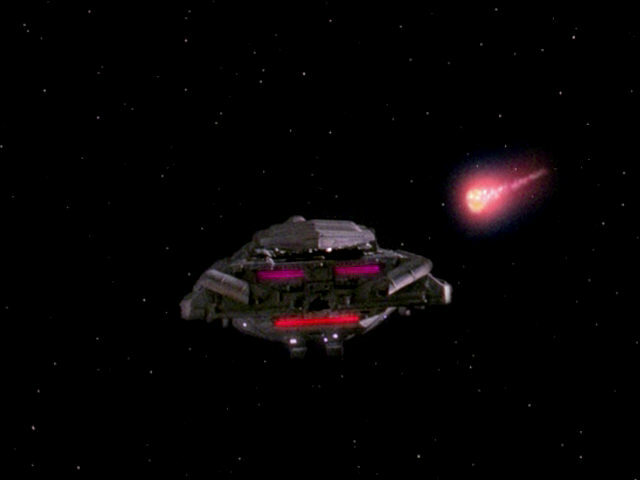 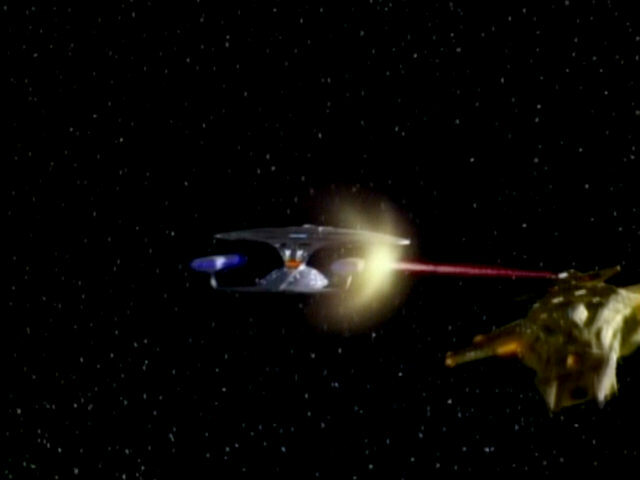 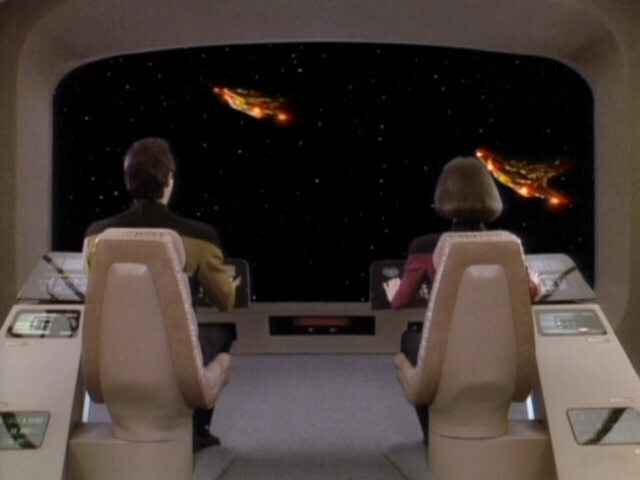 The two Cardassian ships fire at the Bajoran Antares-class carrier, destroying it. 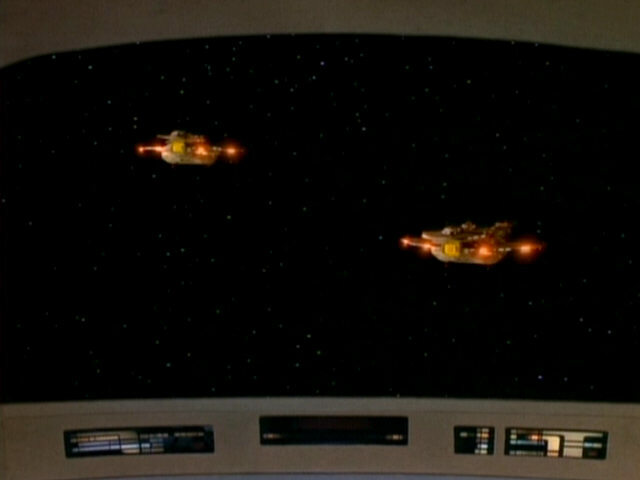 The footage of the two ships flying close to the camera is the same footage seen earlier in the episode on the main viewscreen. 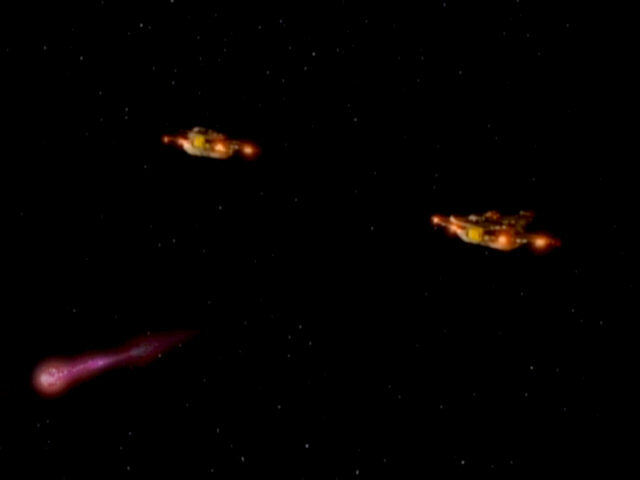 The only difference is the Cardassian weapons fire, which is purple, like in "The Wounded" and unlike later appearances of Cardassian ships firing their weapons. A final look at the Bajoran carrier. 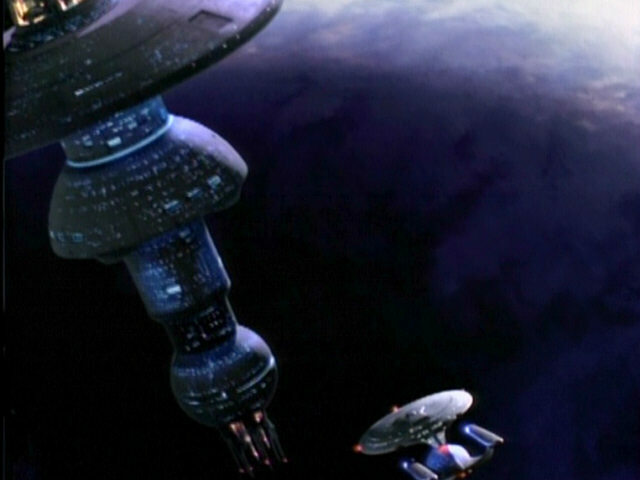 The USS Enterprise-D in orbit of Valo II. 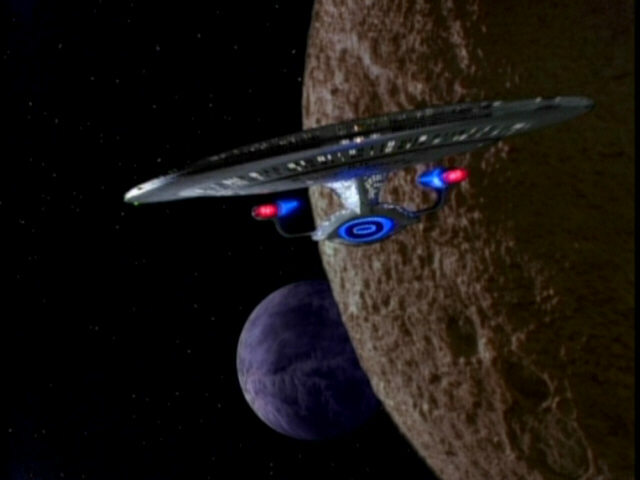 The planet first appeared in "Identity Crisis" as Tarchannen III and would later appear in several more TNG episodes, including "Man of the People" (as Rekag-Seronia) and "A Fistful of Datas" as Deinonychus VII. 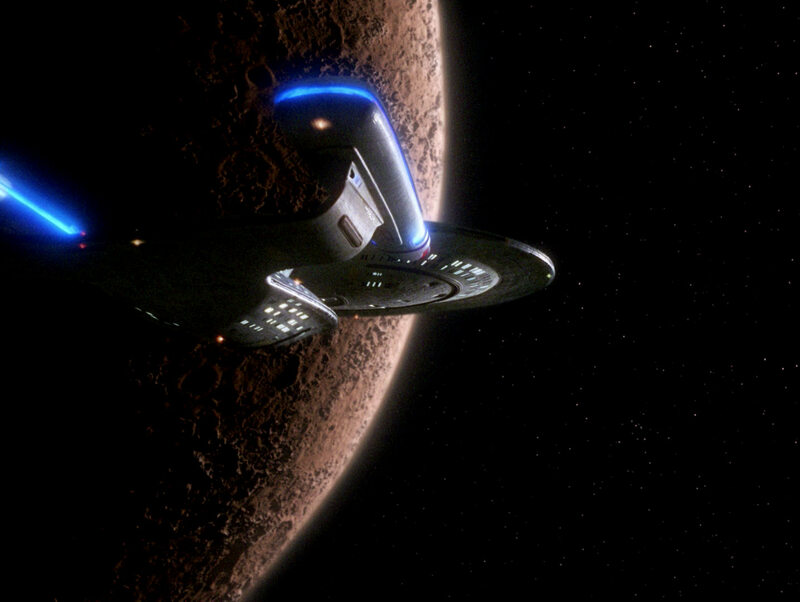 Re-Used Planets in TNG Valo II is represented by a new CG model in TNG-R. 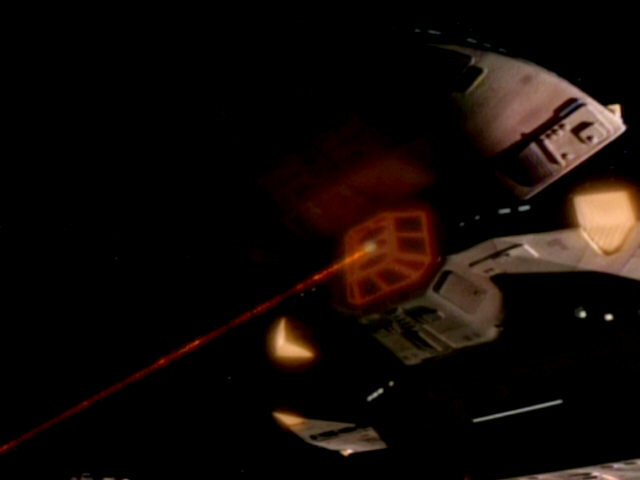 The fire barrel seen in the background also appeared on Gamma Hromi II in "The Vengeance Factor" and on Qo'noS in "Sins of the Father". 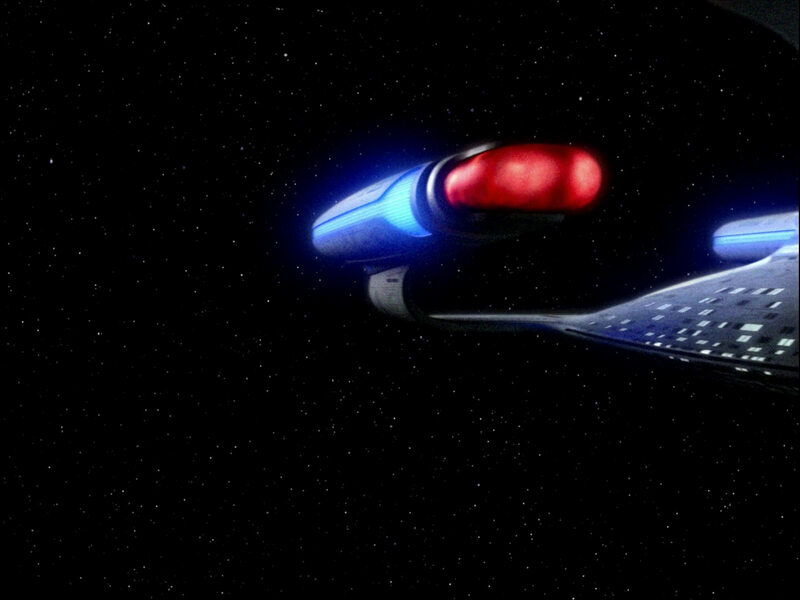 the Father" A look at the prop in HD. 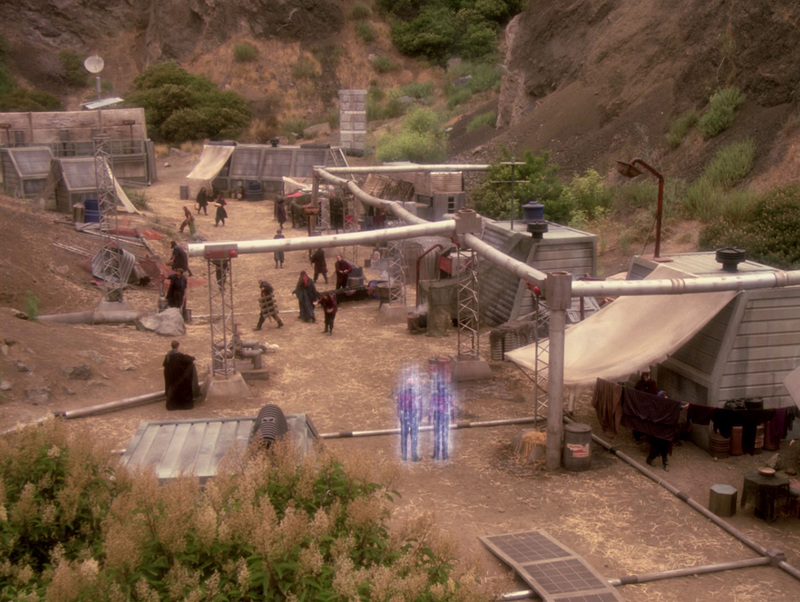 Arabic numerals (05 and 287) are seen on the sides of two barracks on the surface of Valo II. 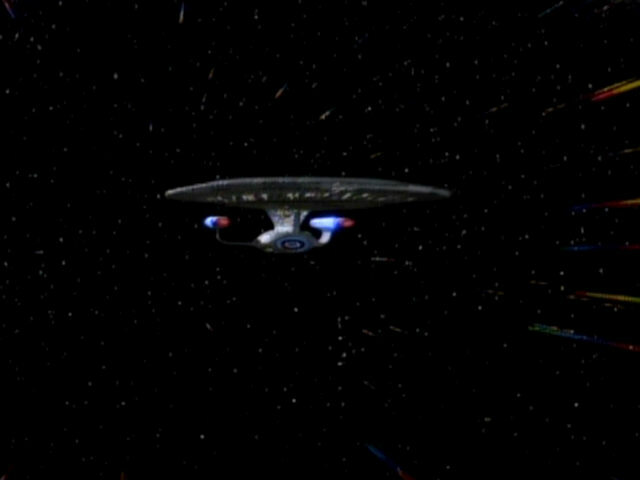 The numbers in HD. 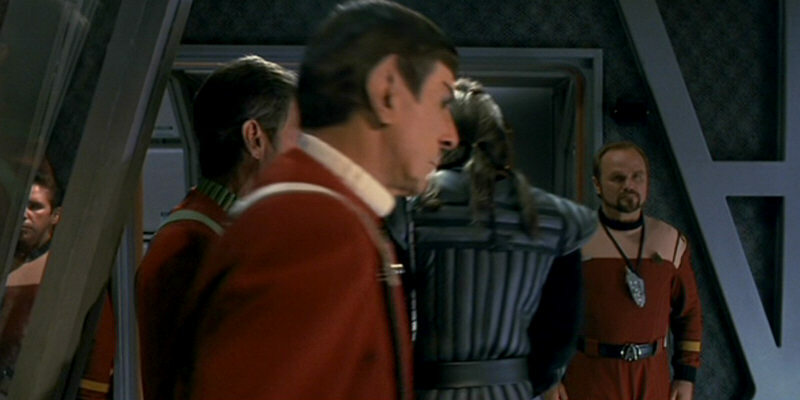 Cargo containers like the ones behind Ensign Ro were also seen on Gamma Hromi II in "The Vengeance Factor" and on the USS Enterprise-D in "The Mind's Eye". 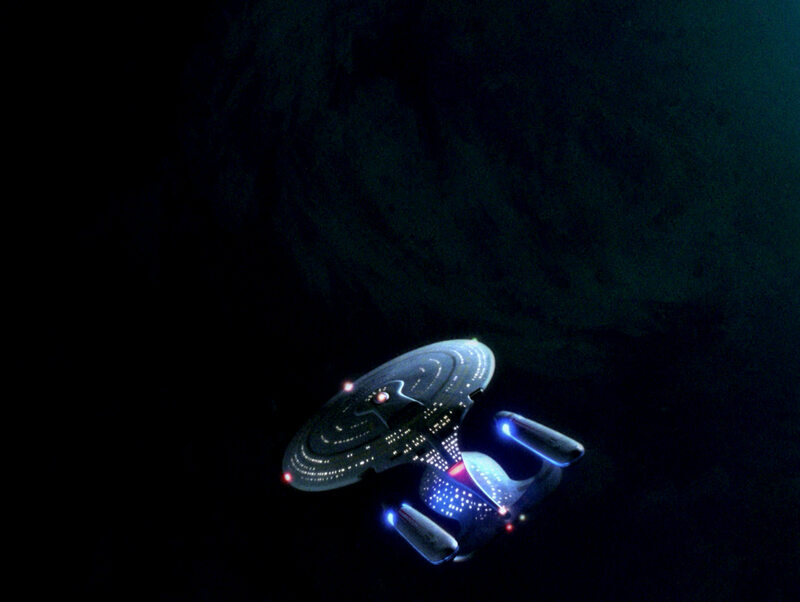 "The Mind's Eye" A look at the prop in HD. 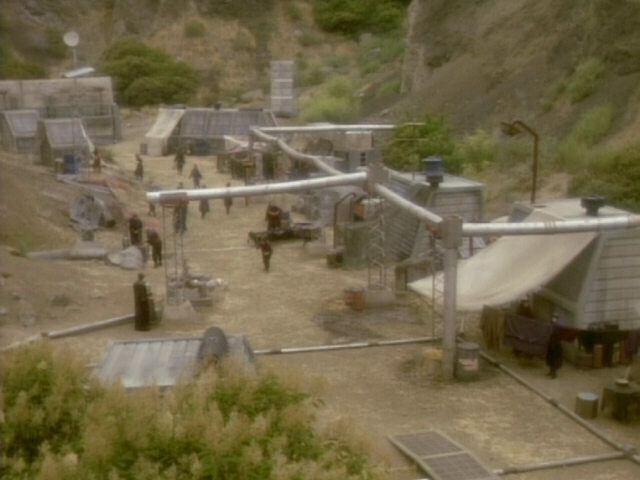 A nice shot of the Bajoran refugee camp on Valo II. 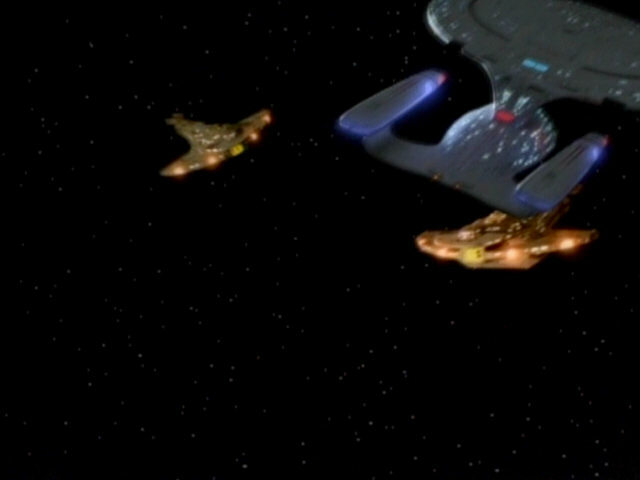 In HD, the Bajoran fowl can be made out much better.